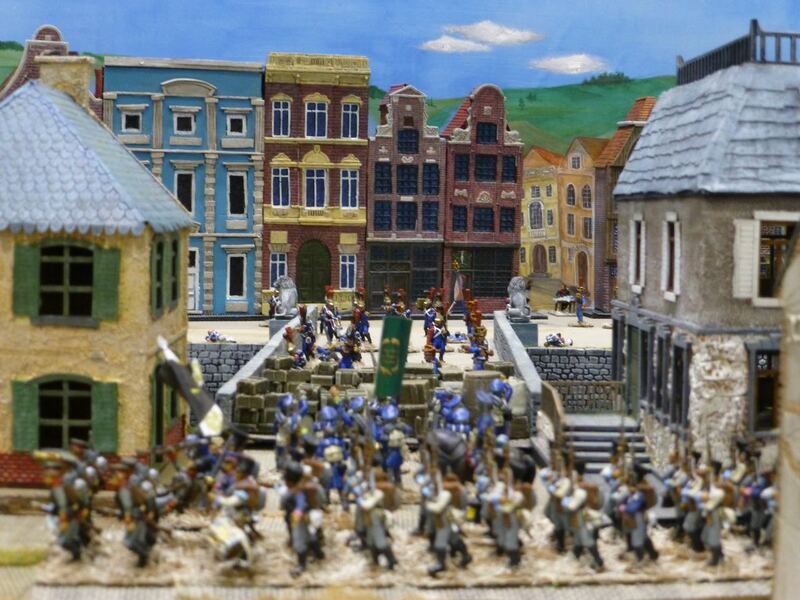 On to the riot of colours and massed ranks of the age dominated by horses, muskets and black powder. 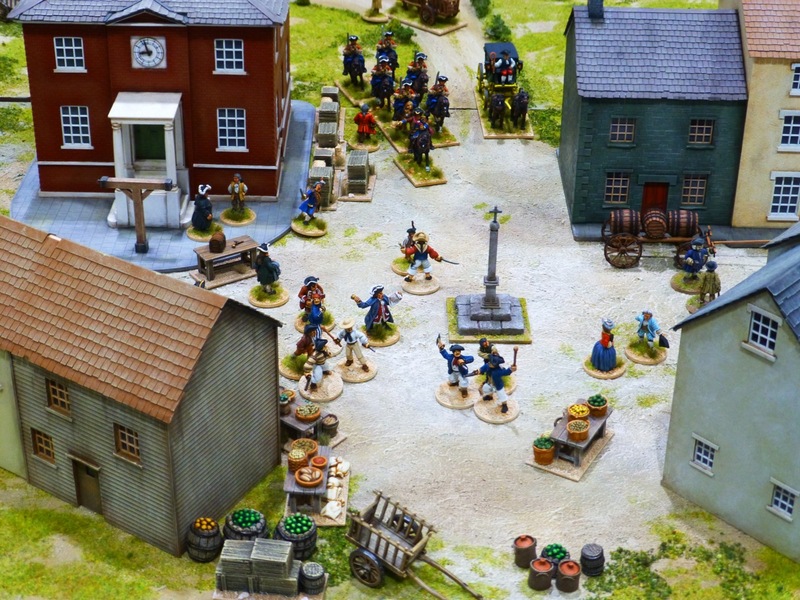 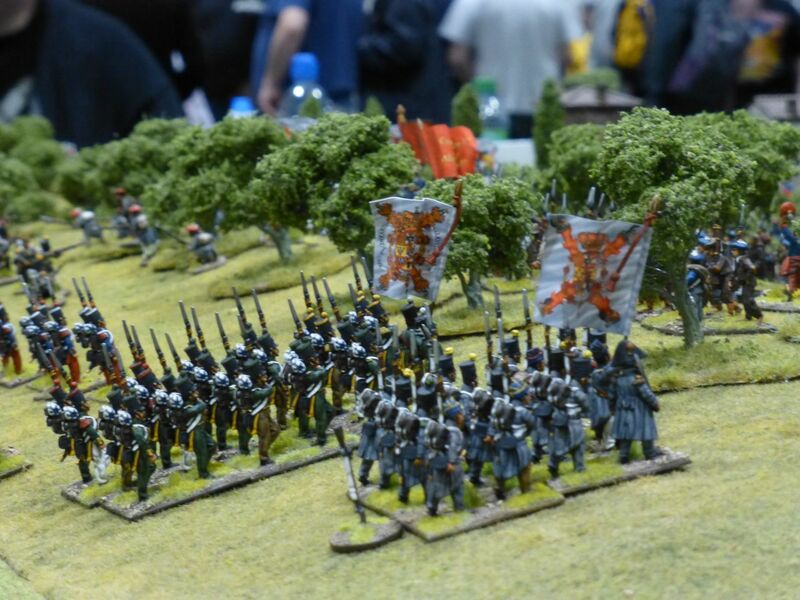 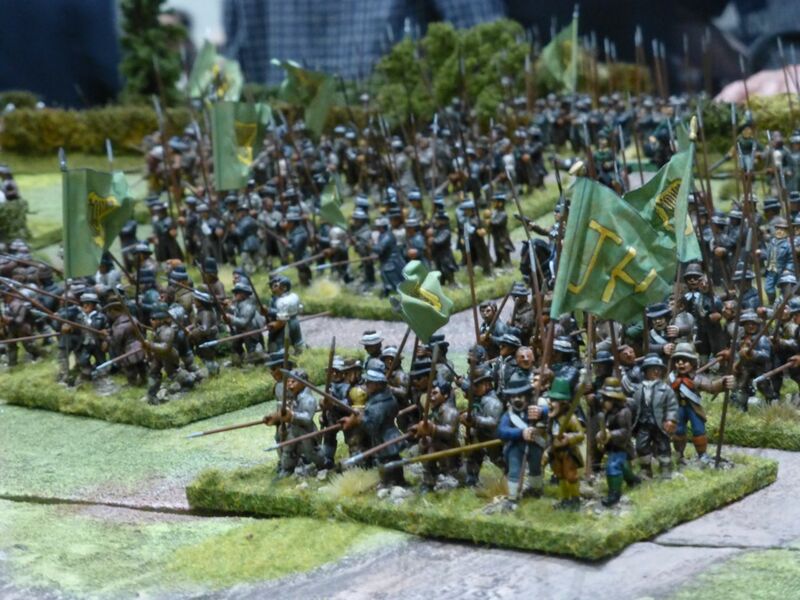 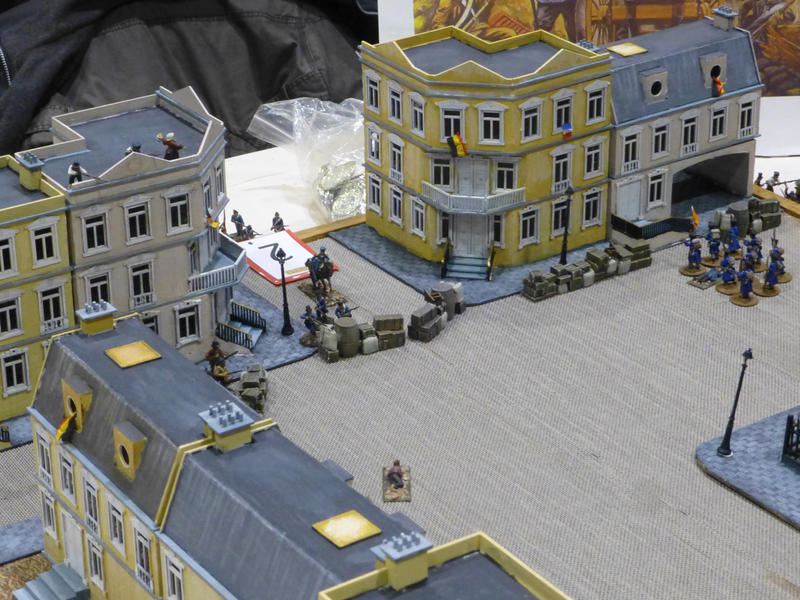 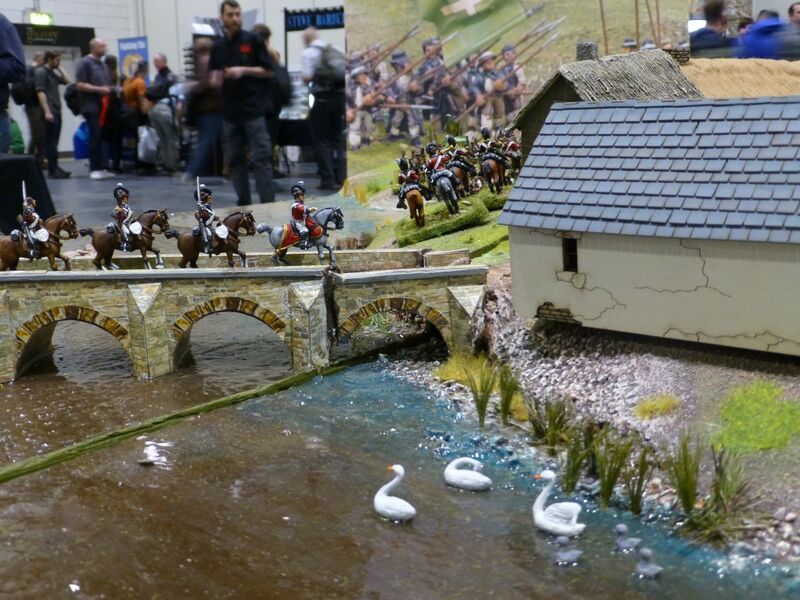 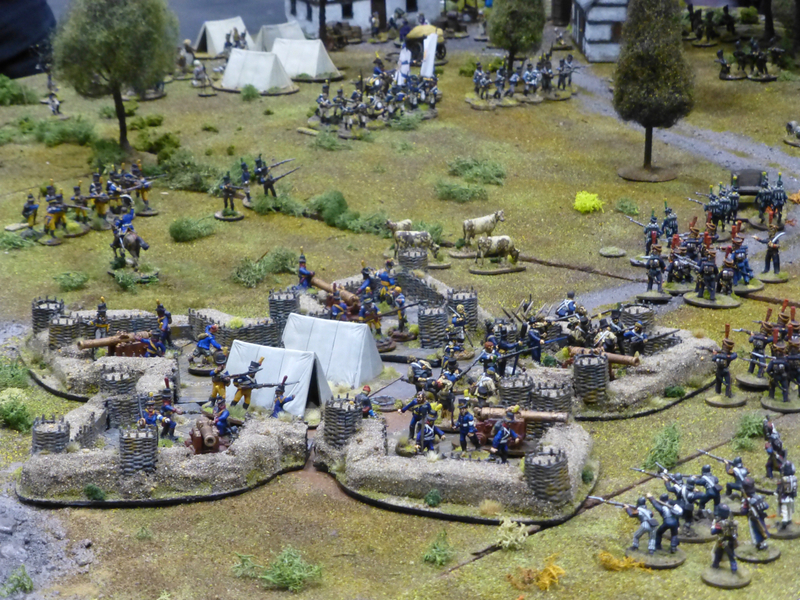 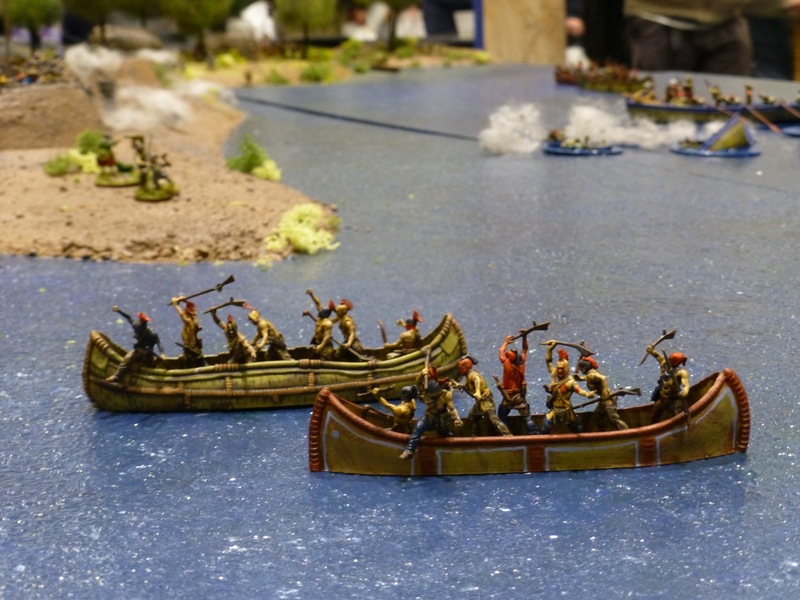 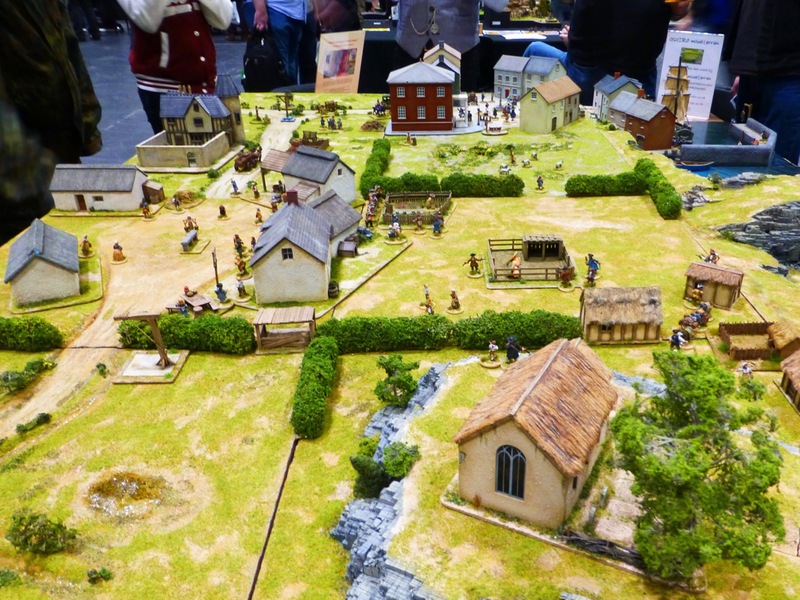 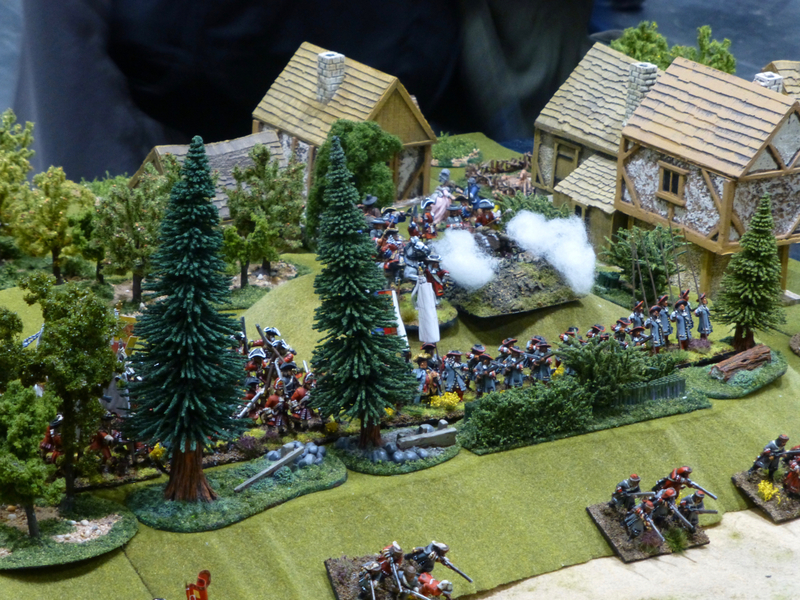 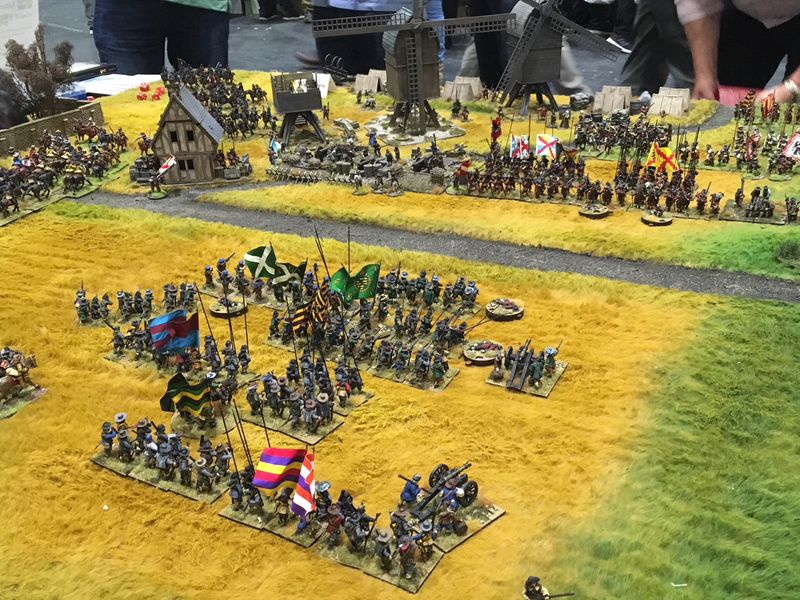 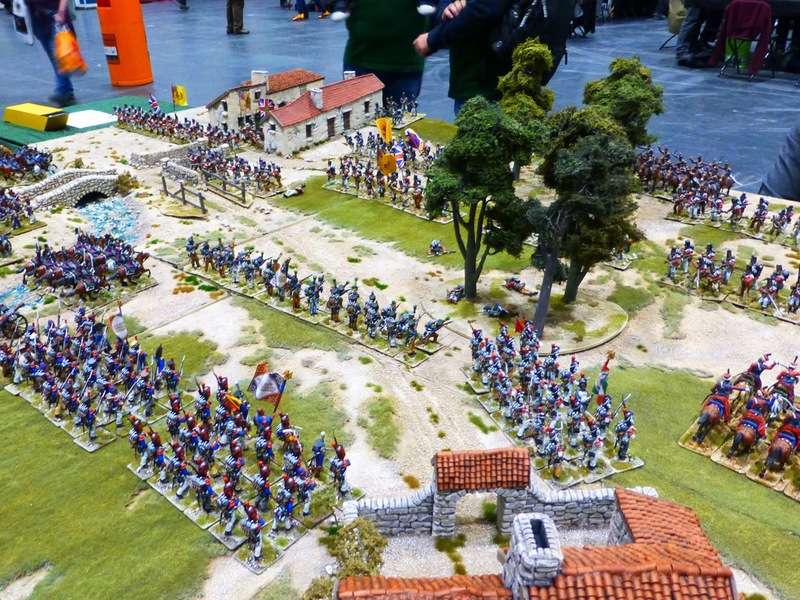 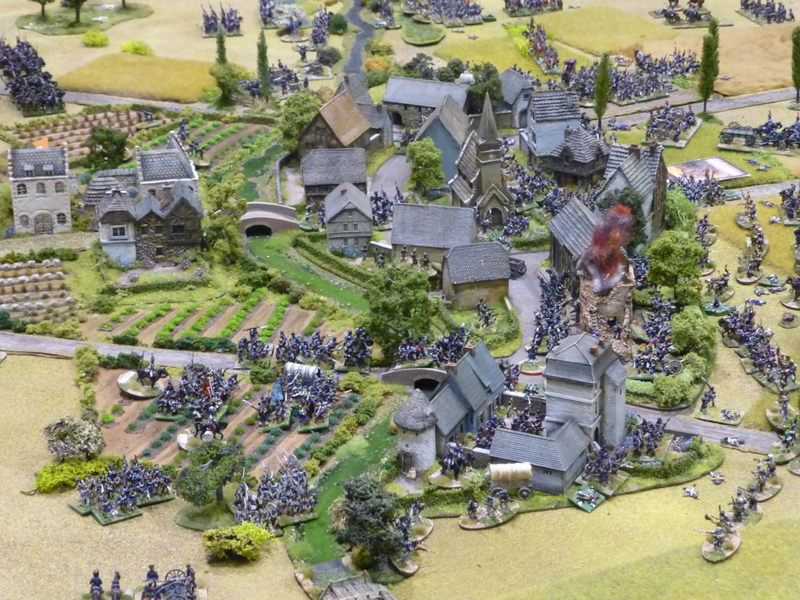 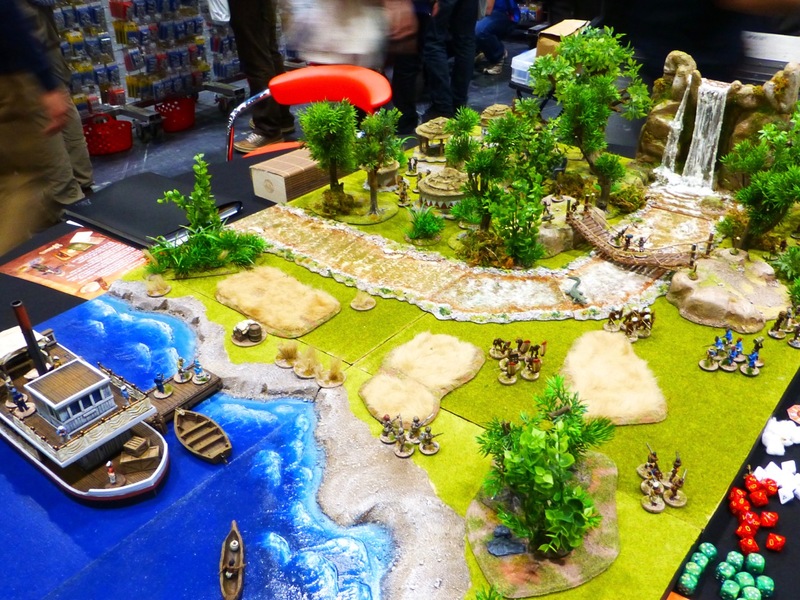 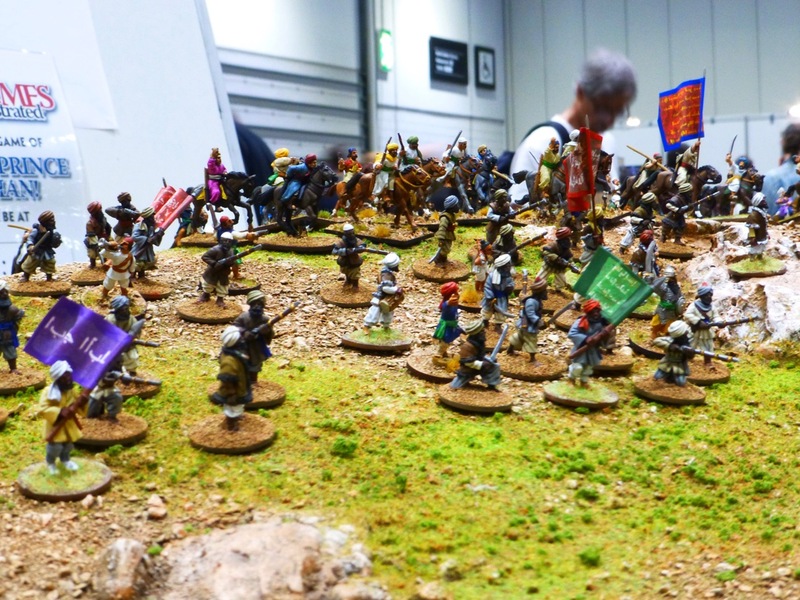 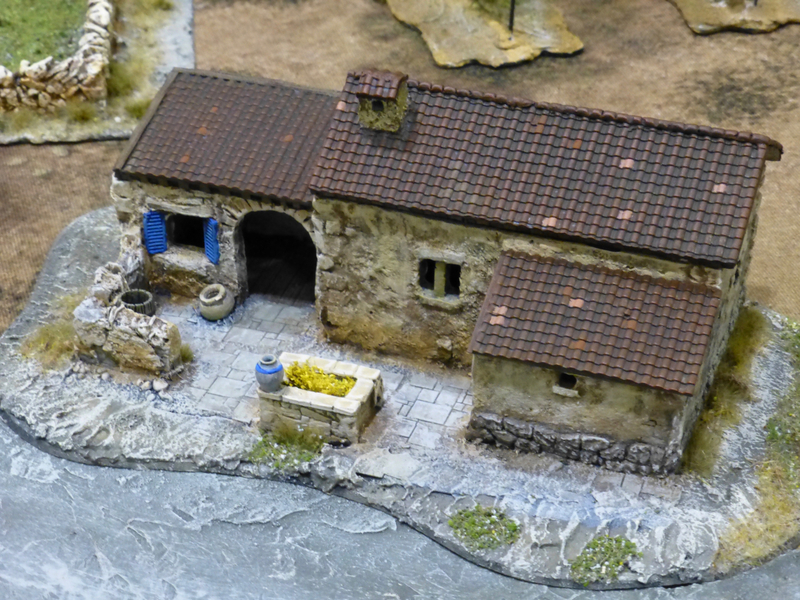 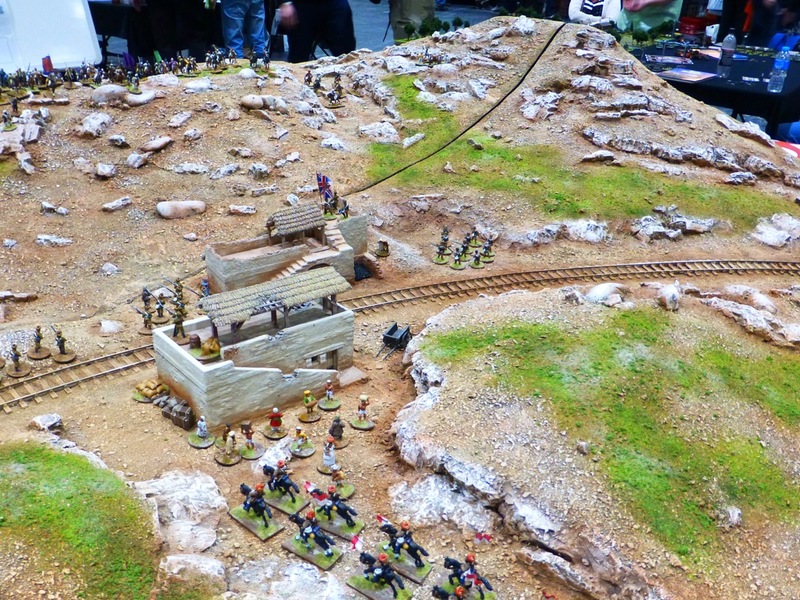 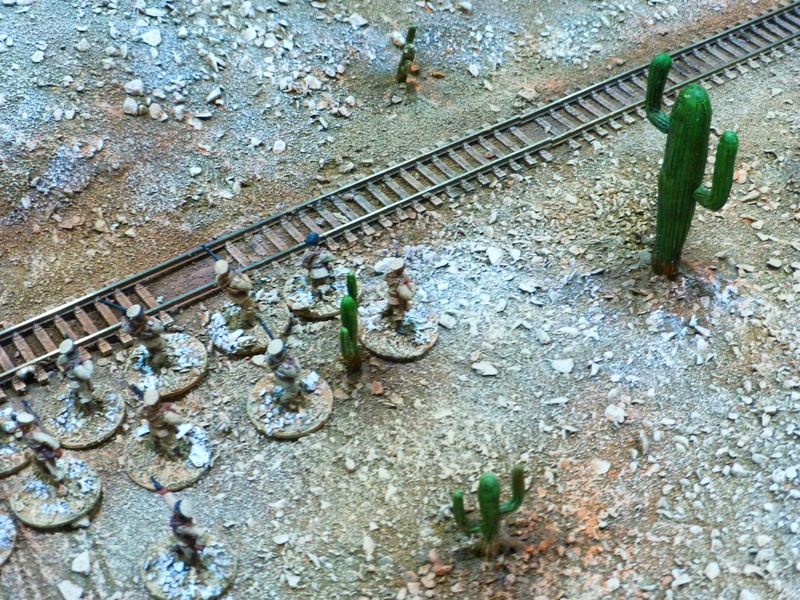 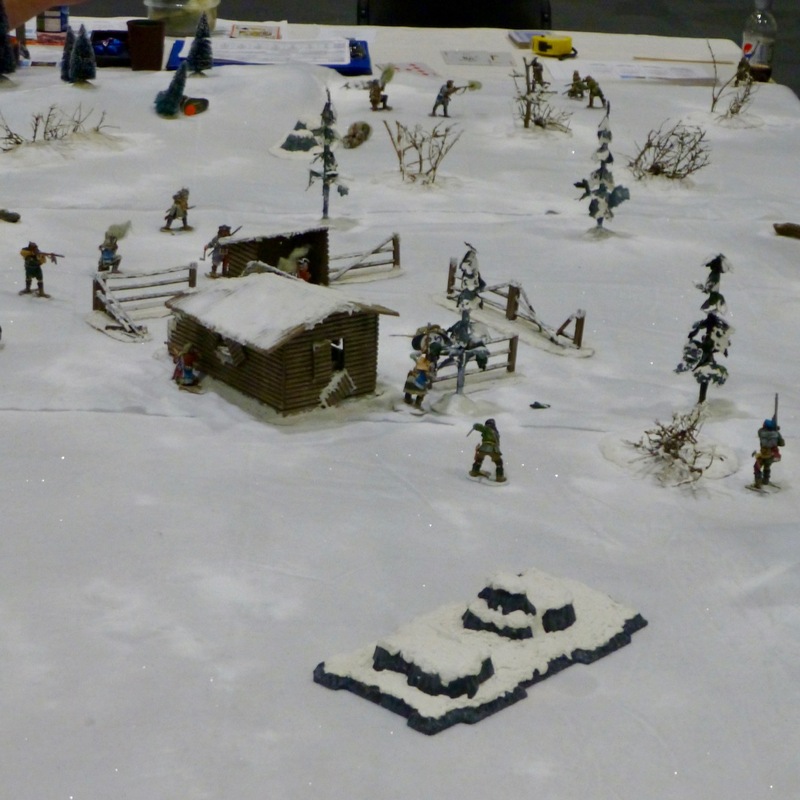 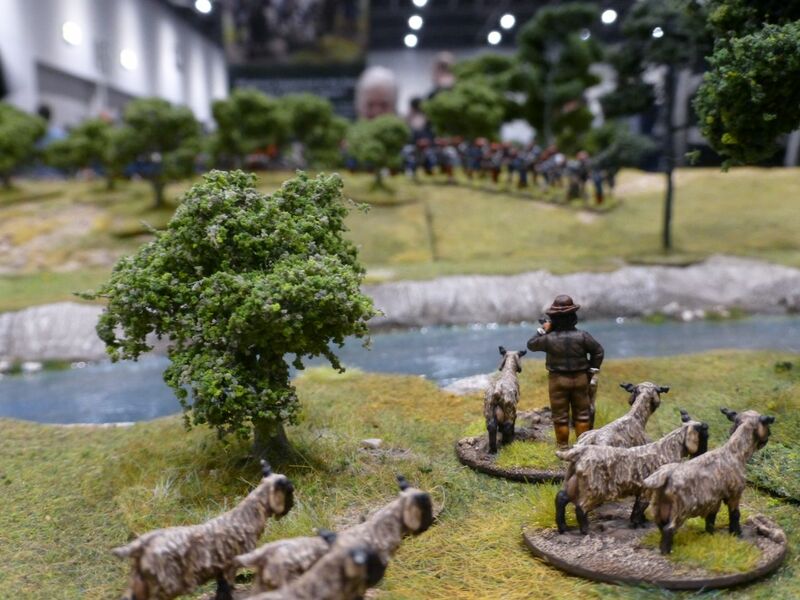 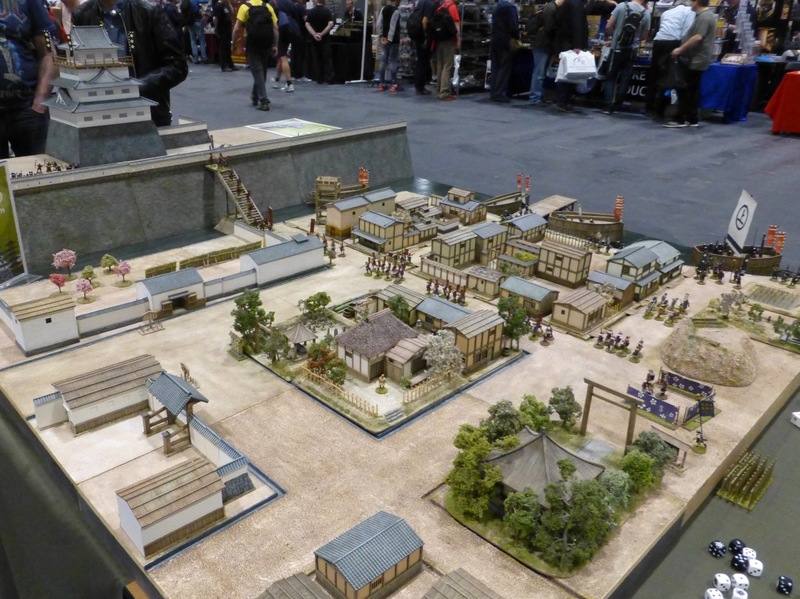 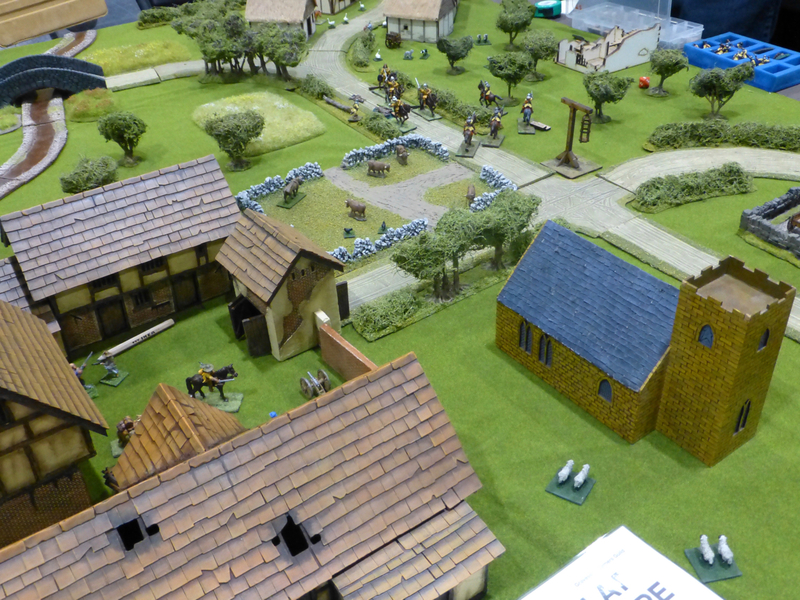 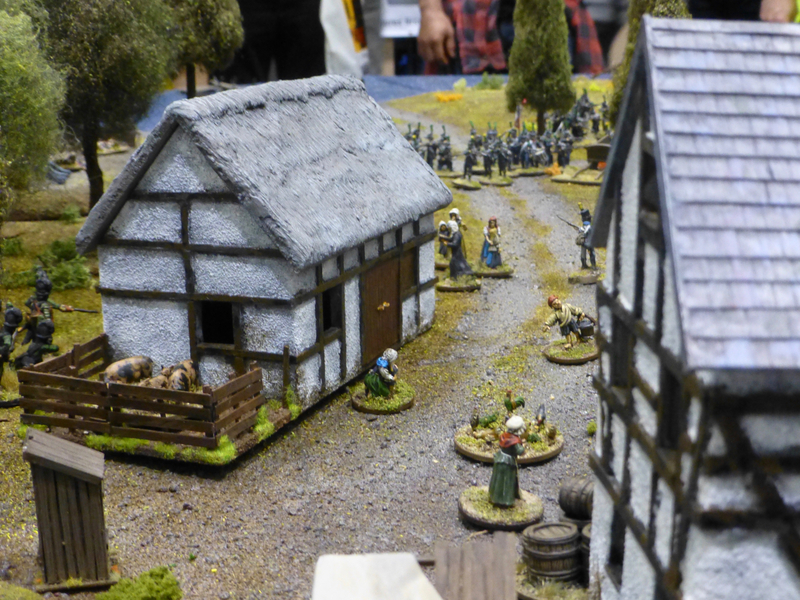 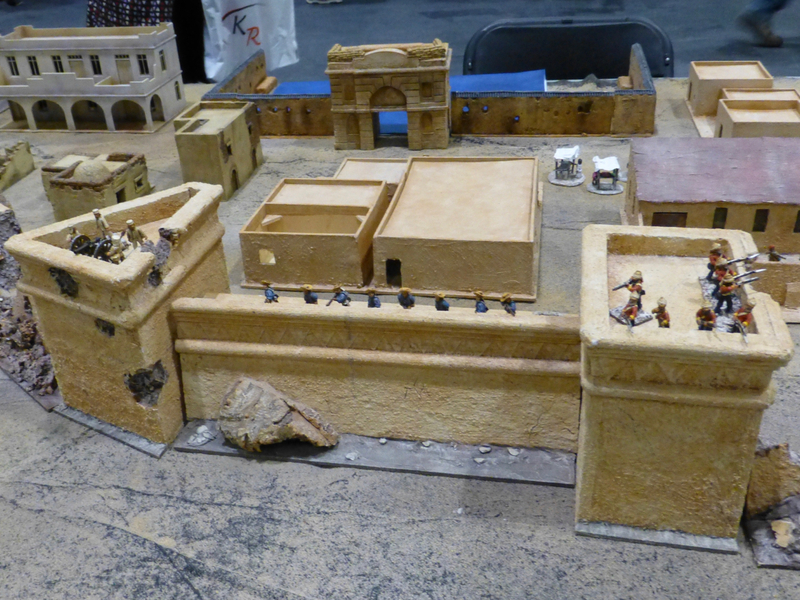 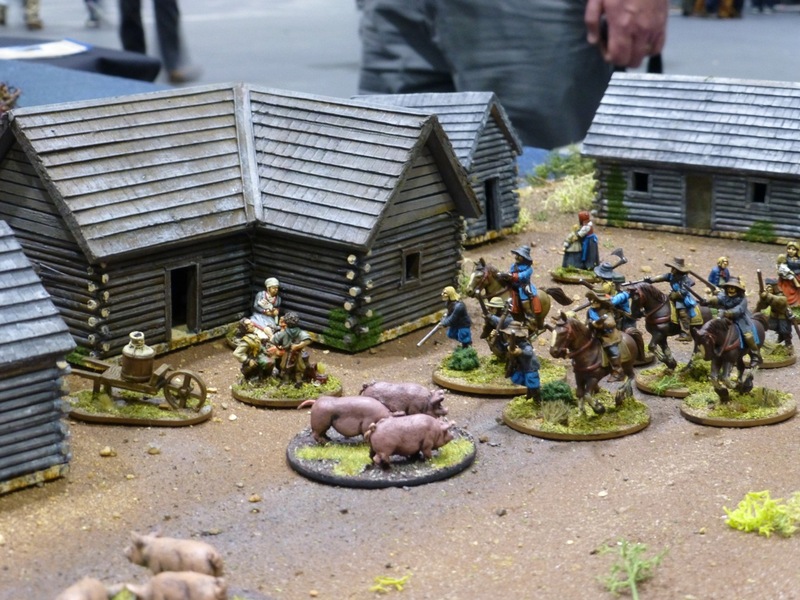 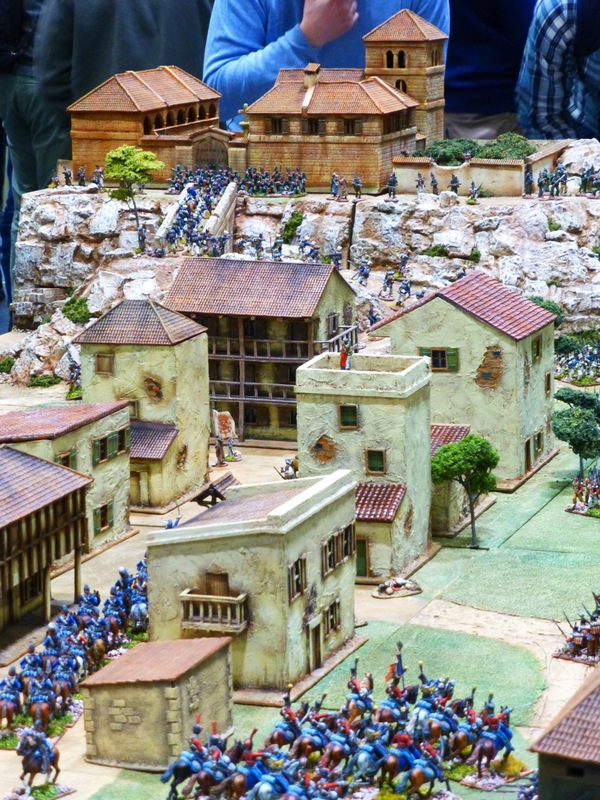 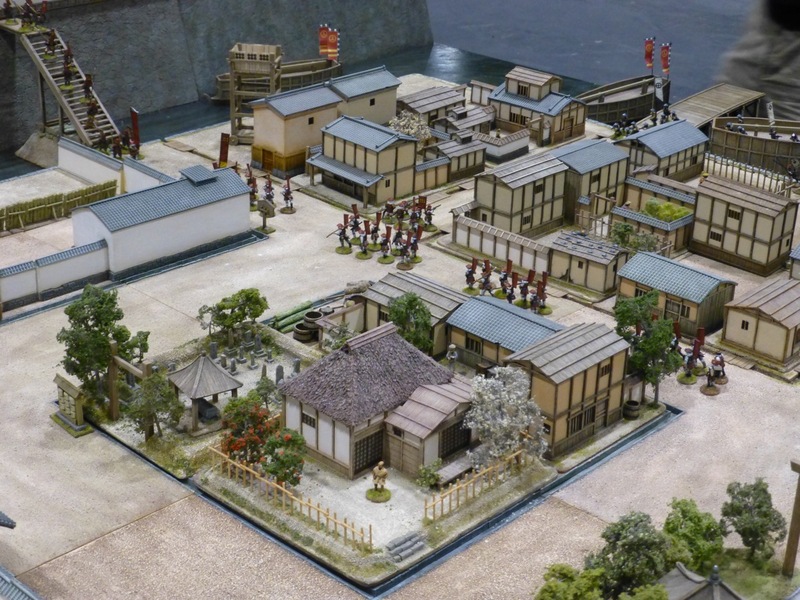 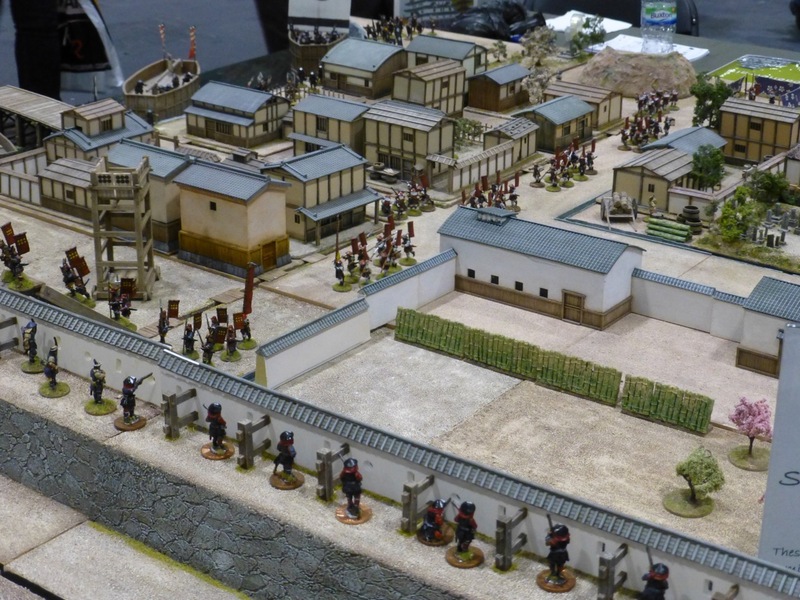 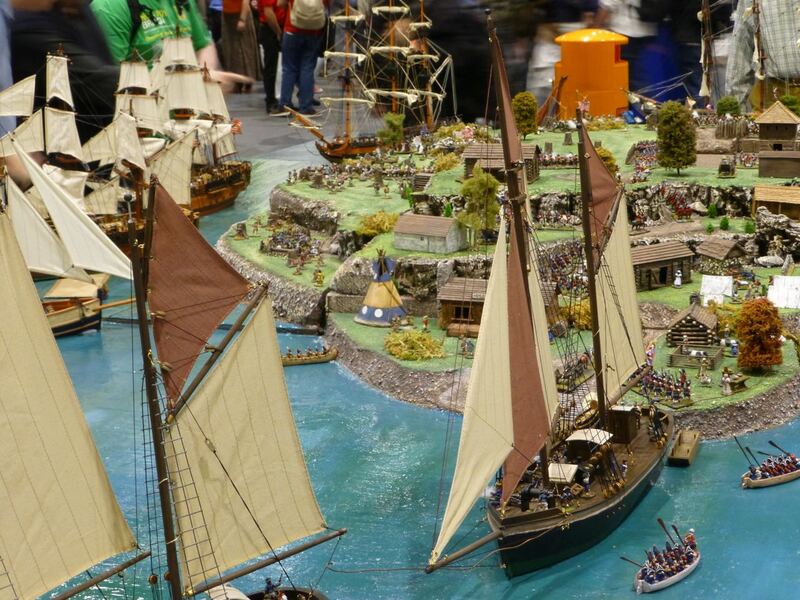 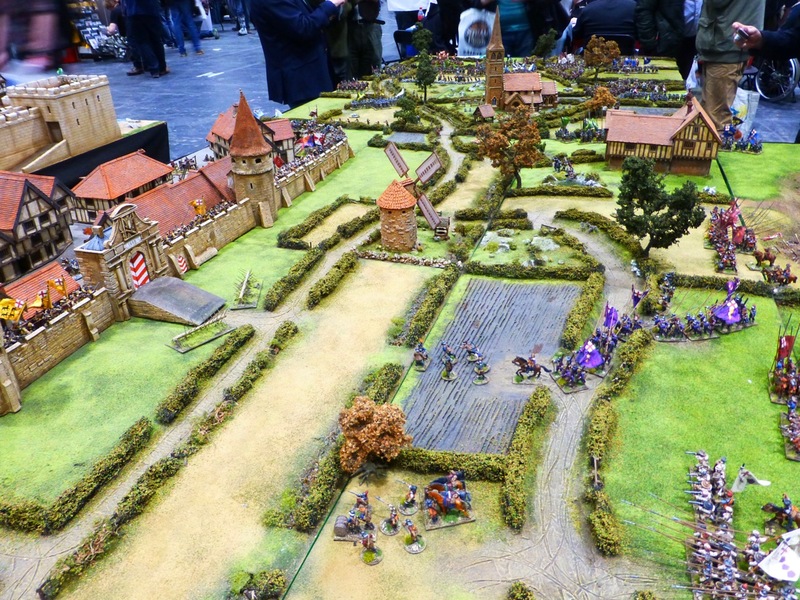 There was a strong showing for this period again at Salute 2019, combining beautifully painted armies and terrain. 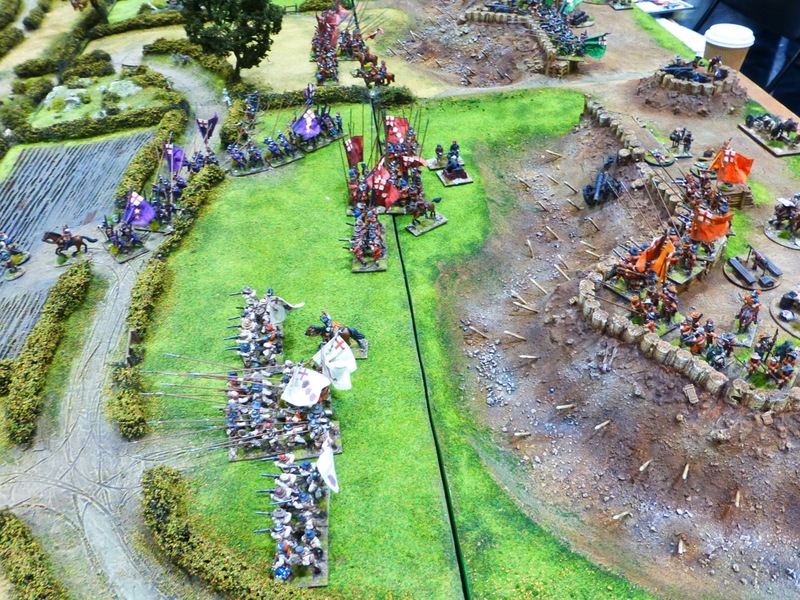 Photos by myself and undeadhighelf. 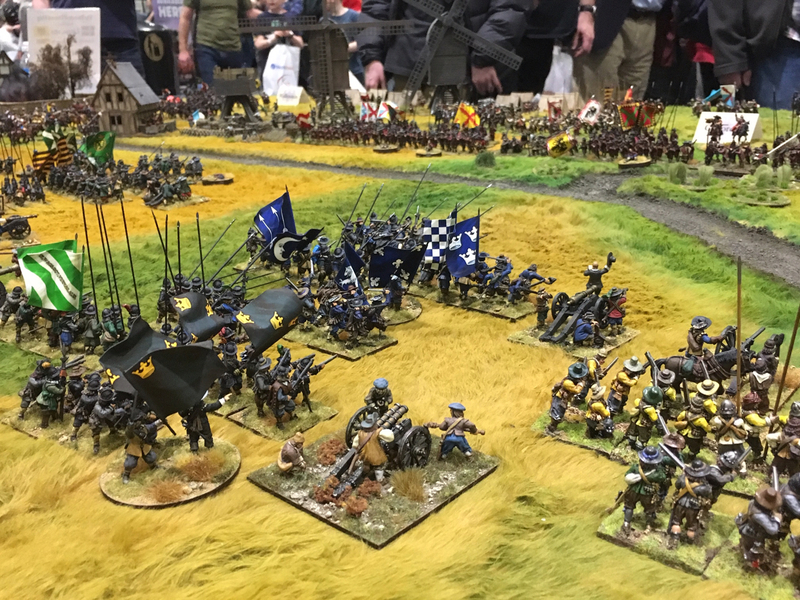 One of the largest and best displays came courtesy of the Crewe & Nantwich Wargaming Club and the Battle of Aughrim 1691 during the Williamite Wars in Ireland. 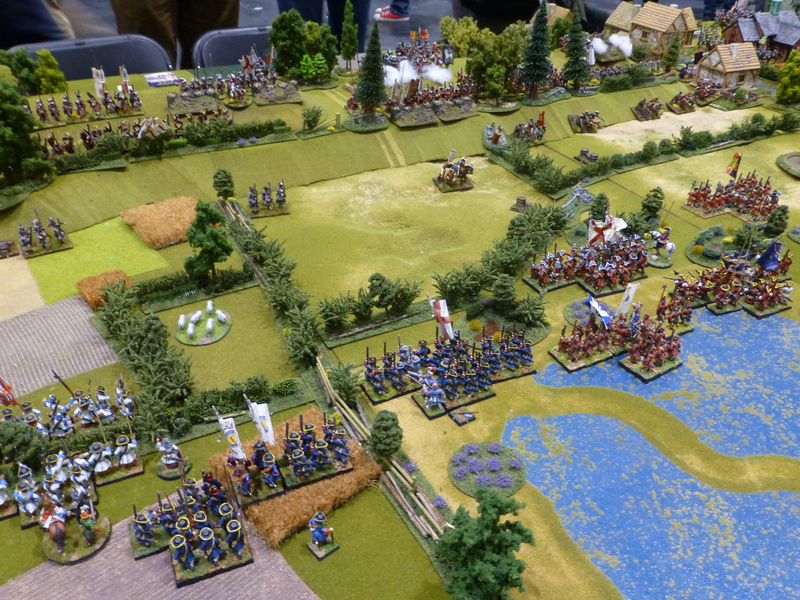 The Friends of General Haig fought the Battle of Lützen 1632 between the Swedish and the Holy Roman Empire, which saw the death of Gustavus Adolfus (historically, not sure if he had a better fate during this recreation). 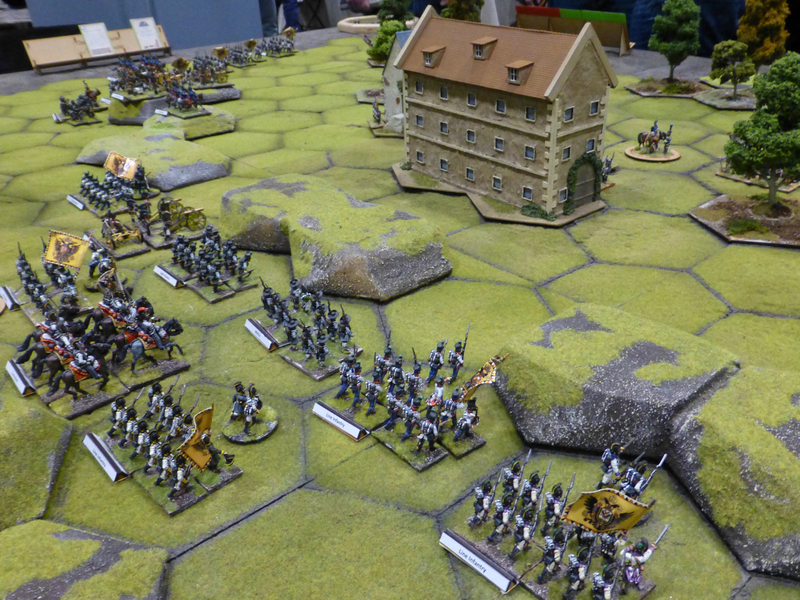 The Old Guard fought a battle during the Napoleonic Wars, as one would expect from their name, using the Command & Colours rules set. 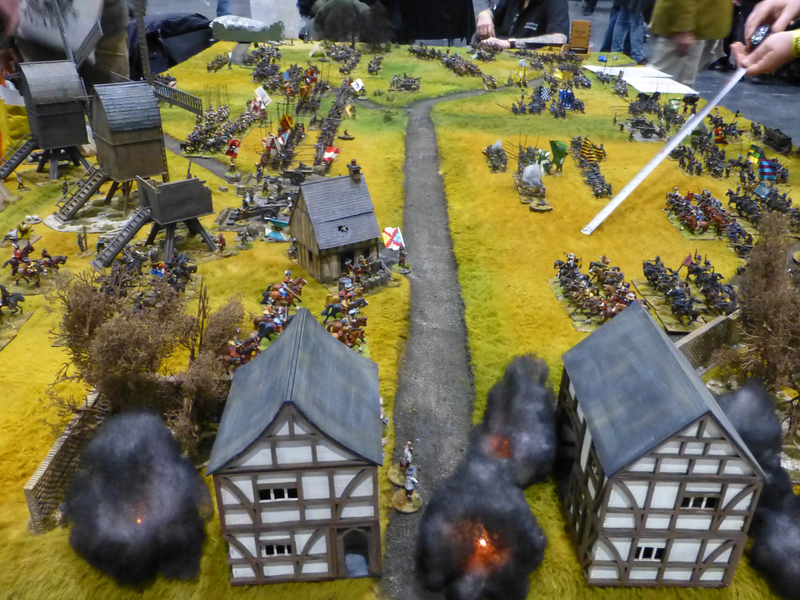 Dalauppror presented the Battle of Dänholm during the Siege of Stralsund 1807 which won this year’s Robert Bothwell Memorial Award for Best Historical Game at Salute. 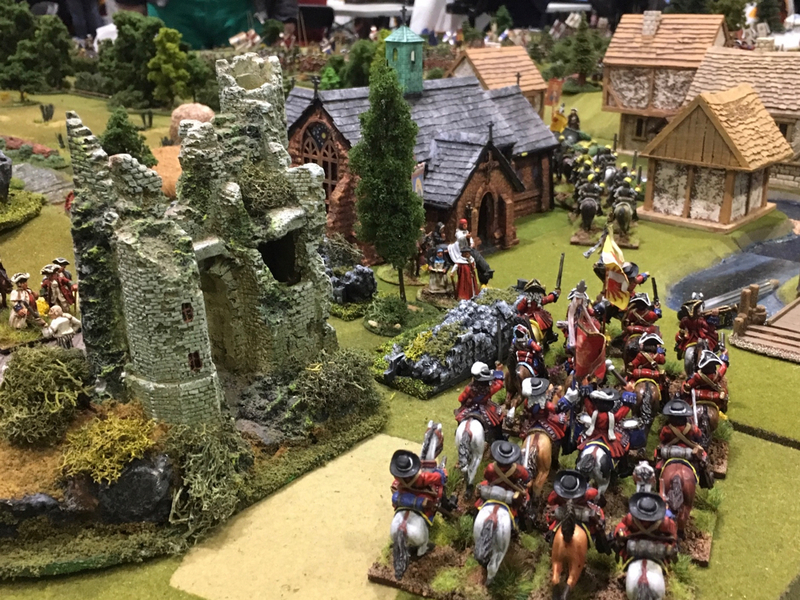 More games from this period were fought by the Gravesend Gamers Guild, Tin Soldiers of Antwerp, Wargamer Poland and Loughton Strike Force. 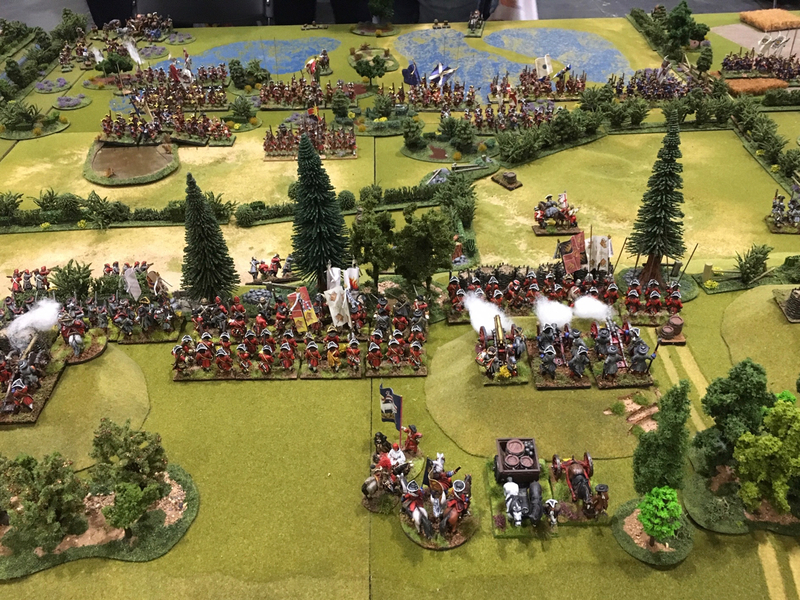 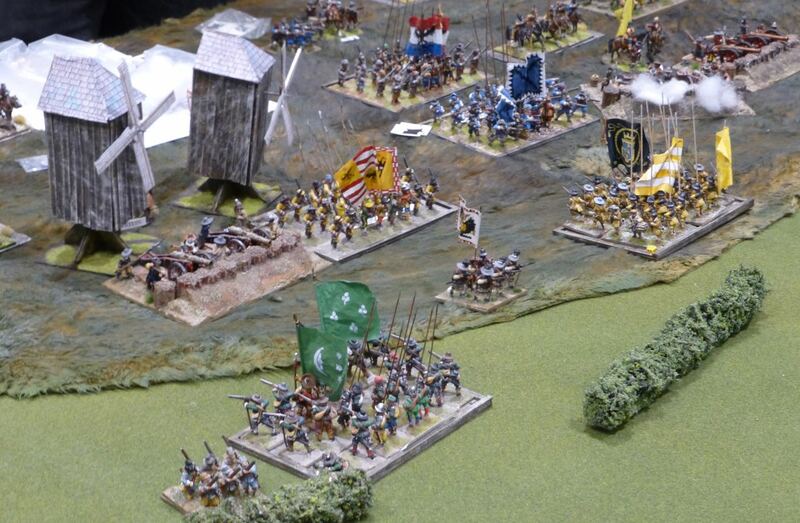 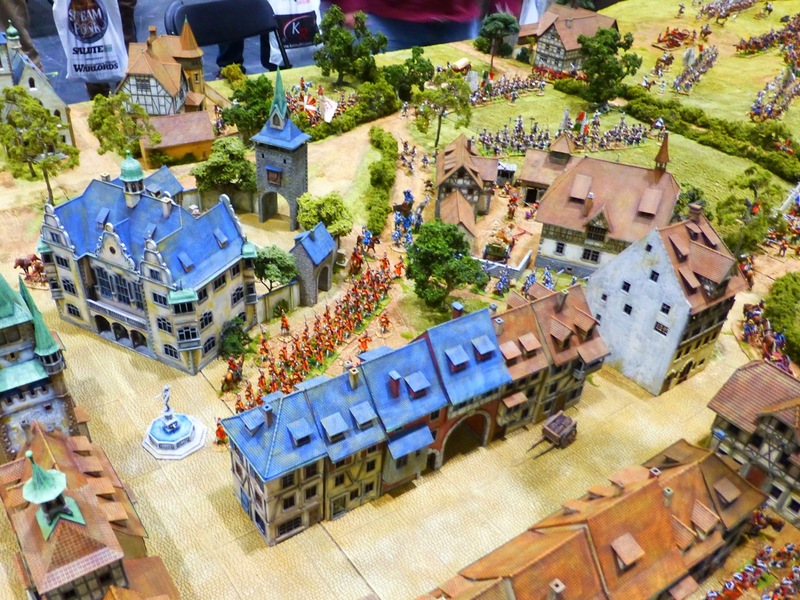 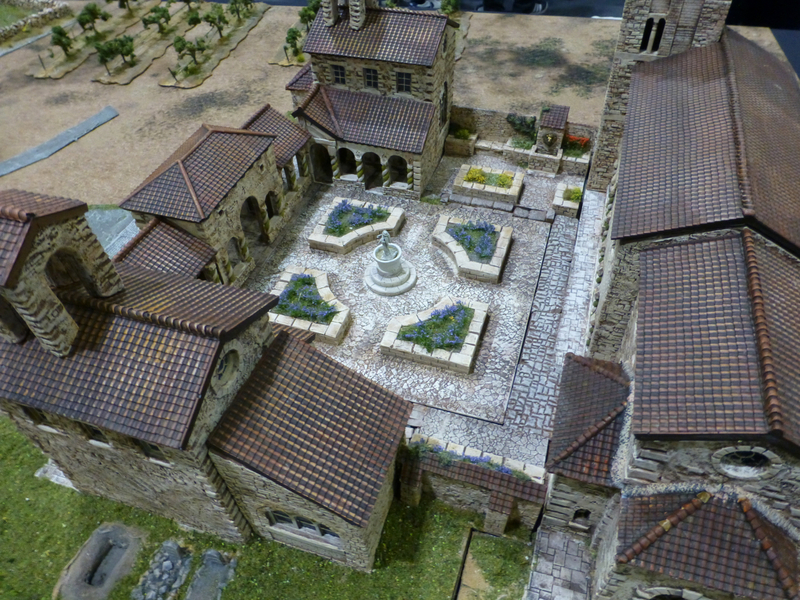 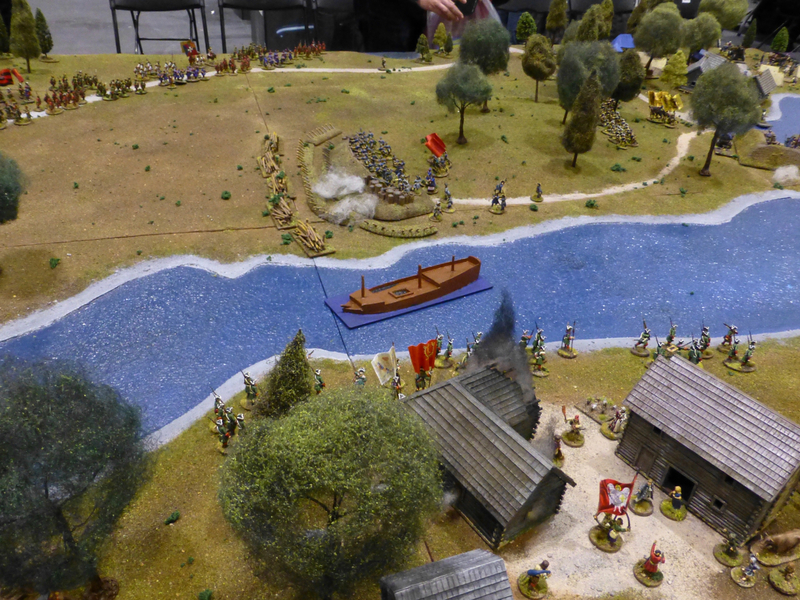 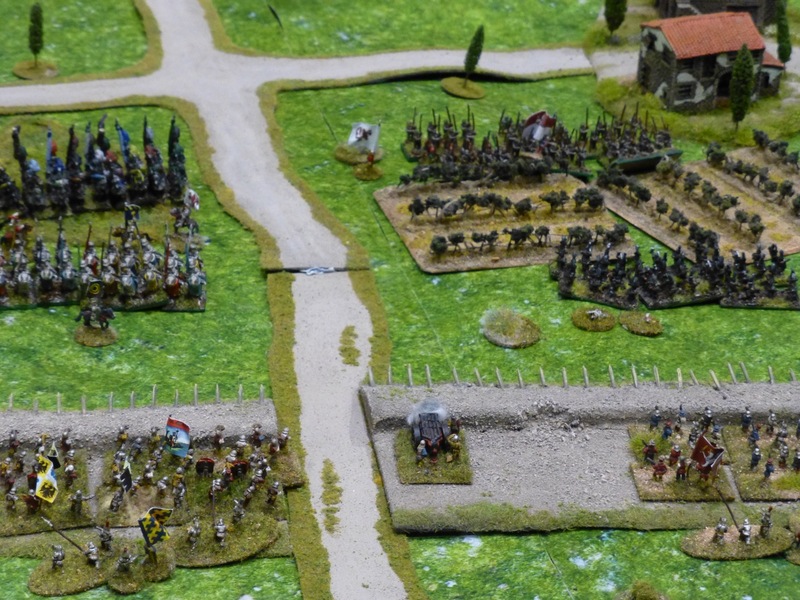 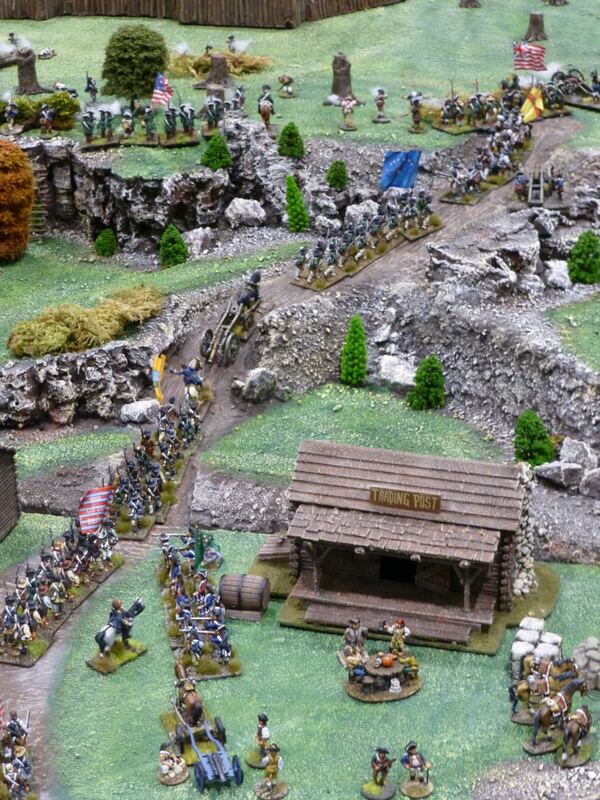 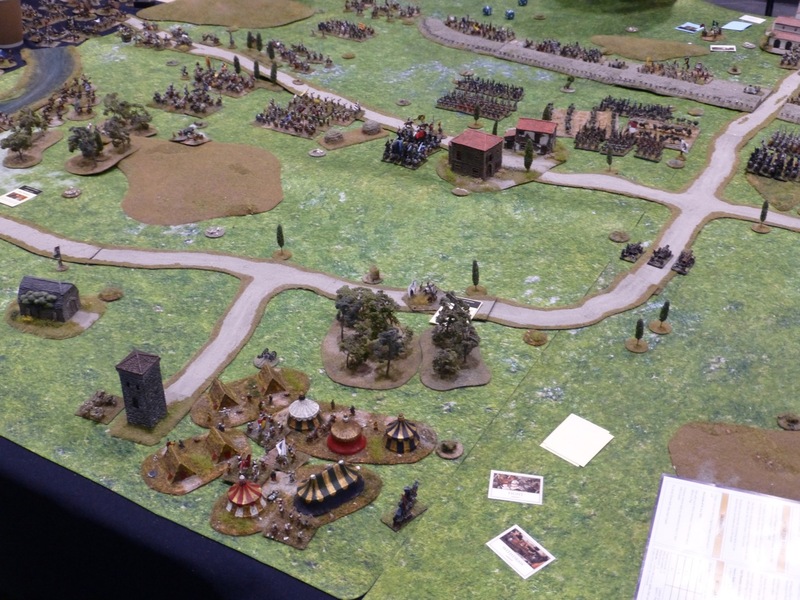 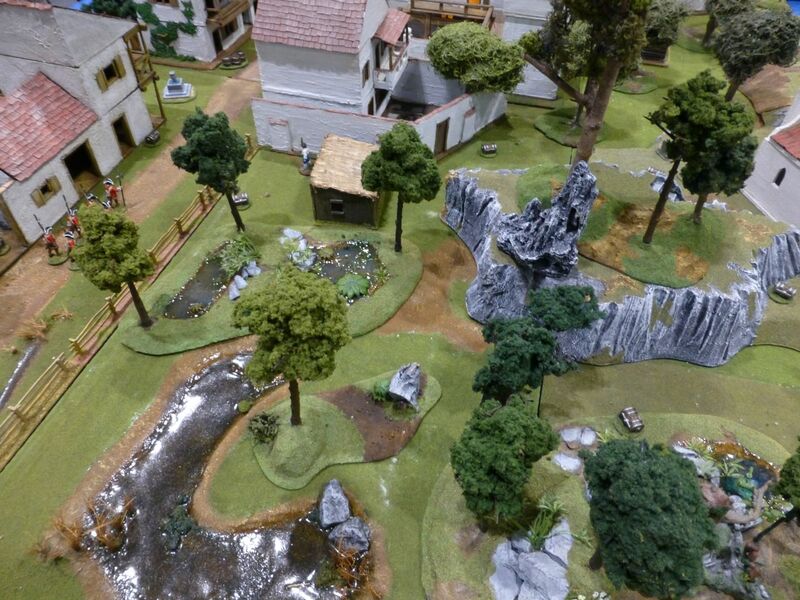 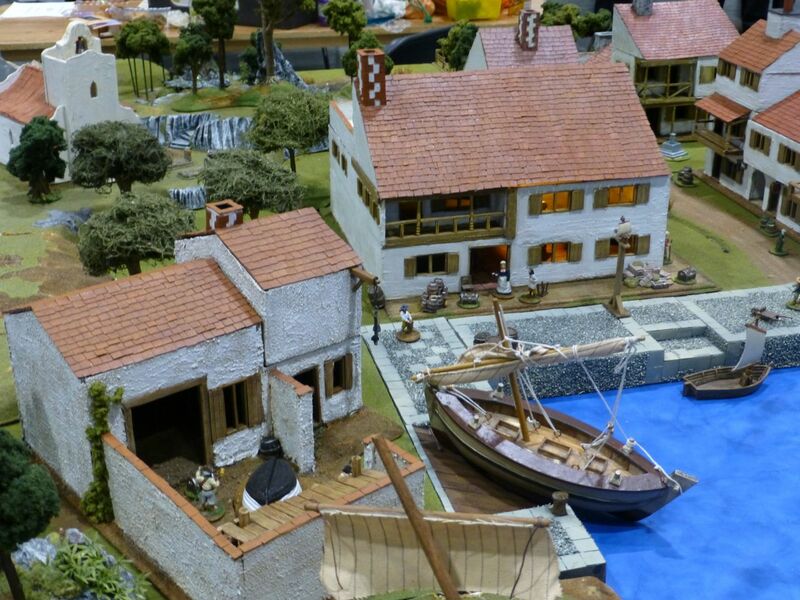 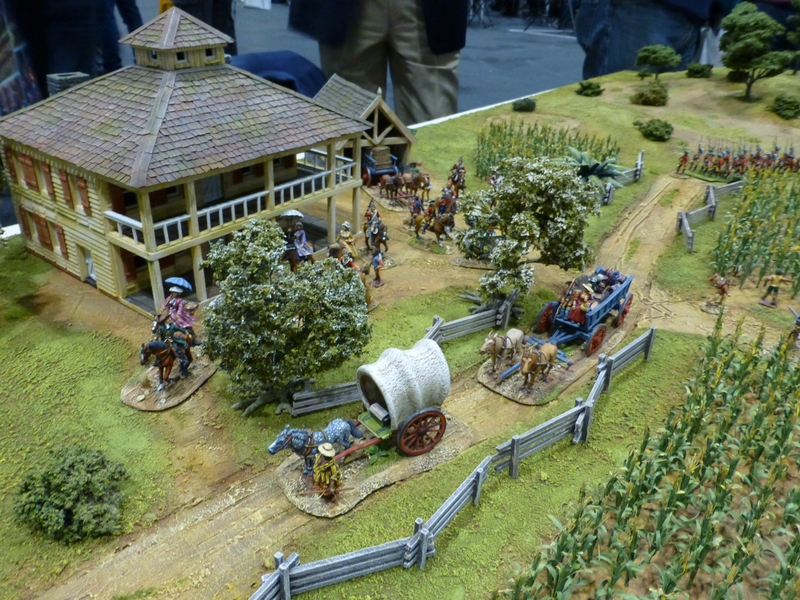 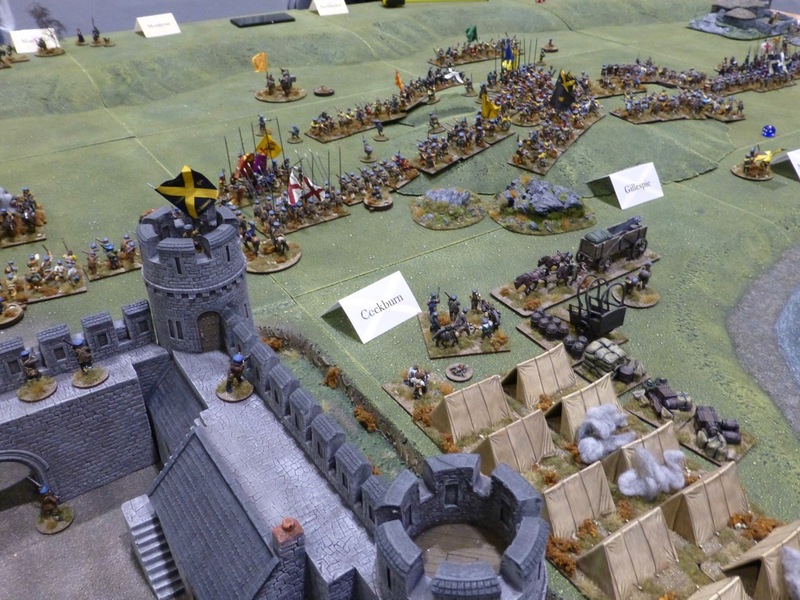 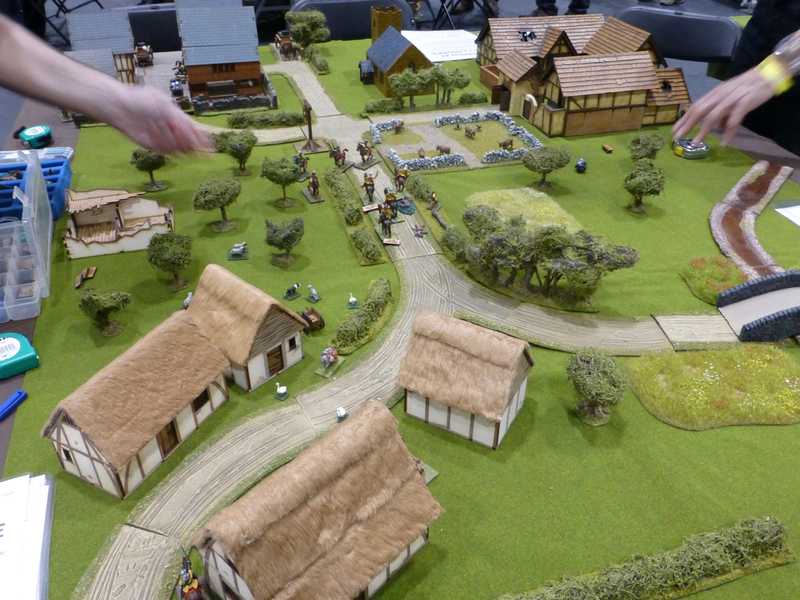 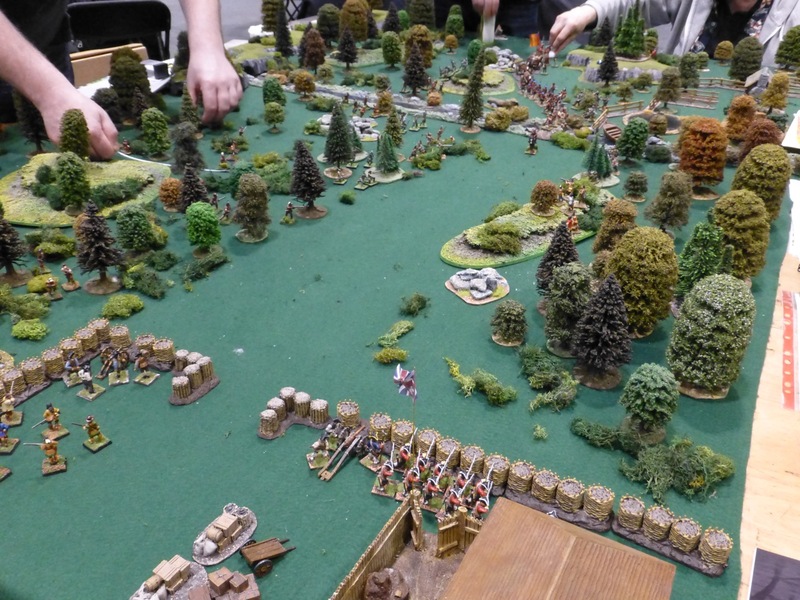 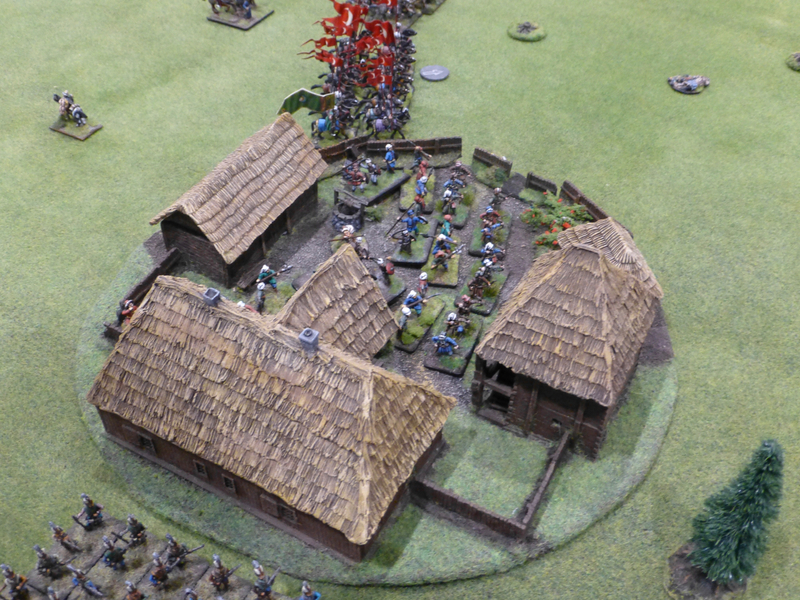 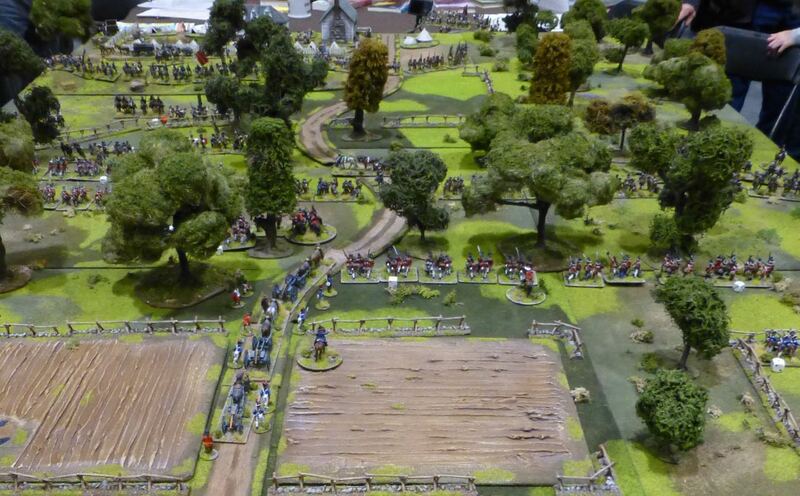 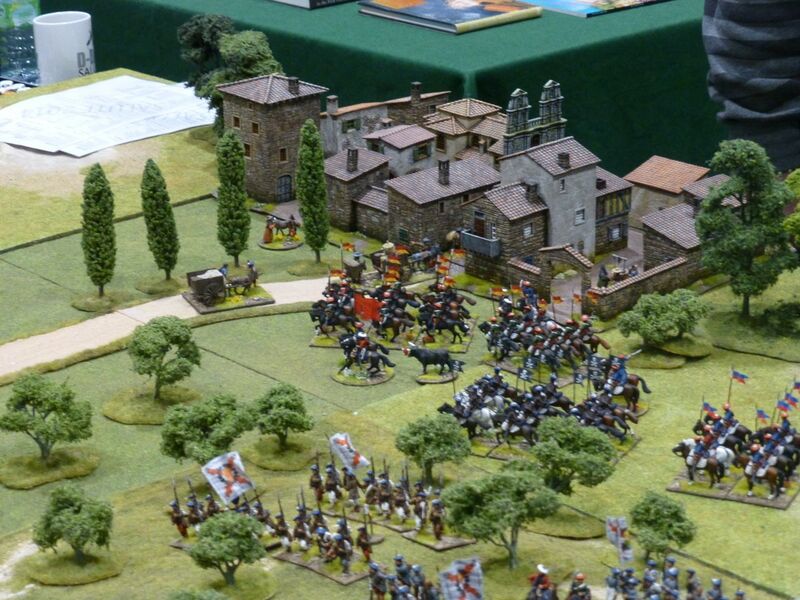 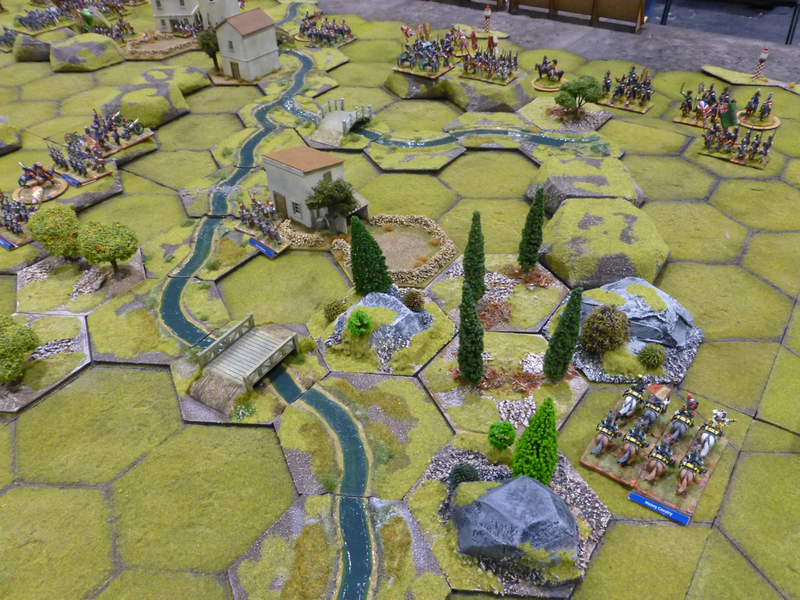 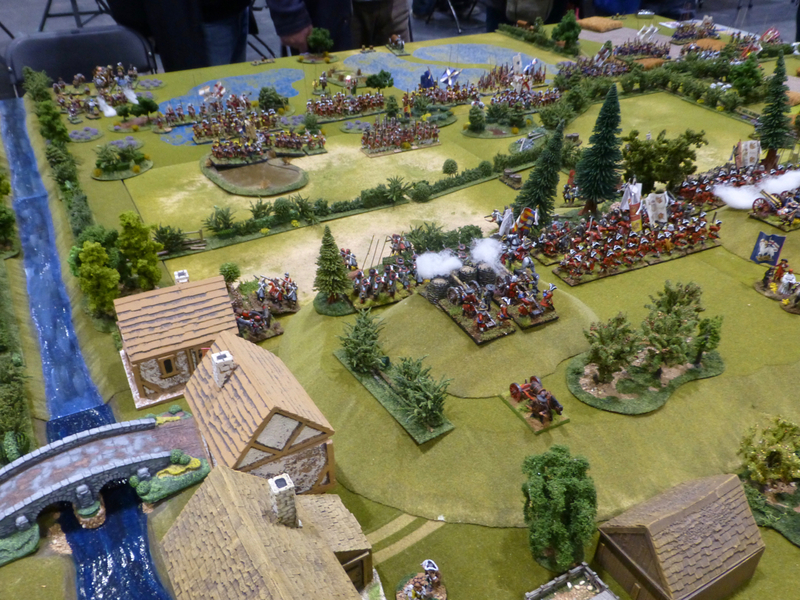 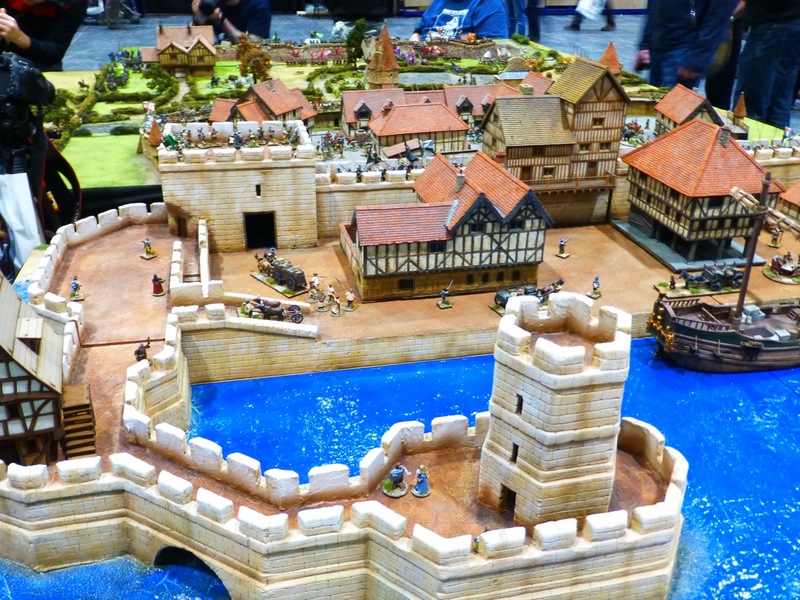 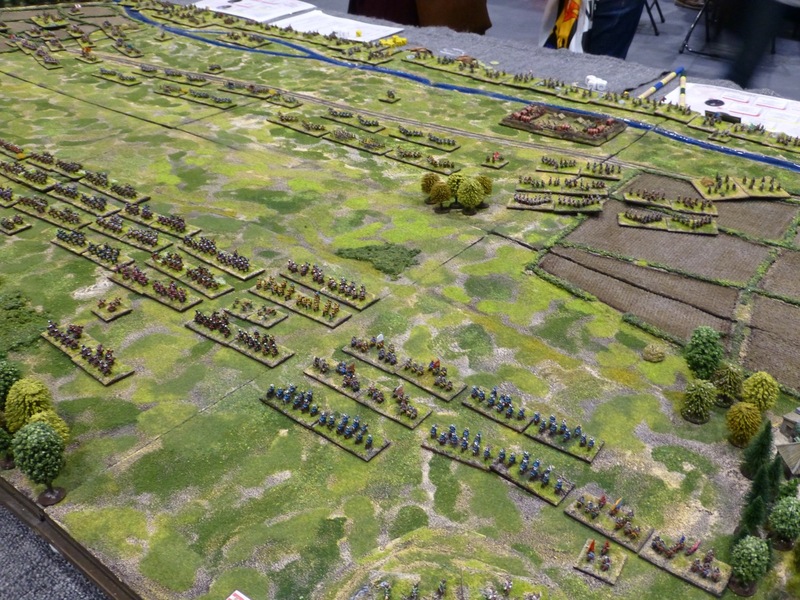 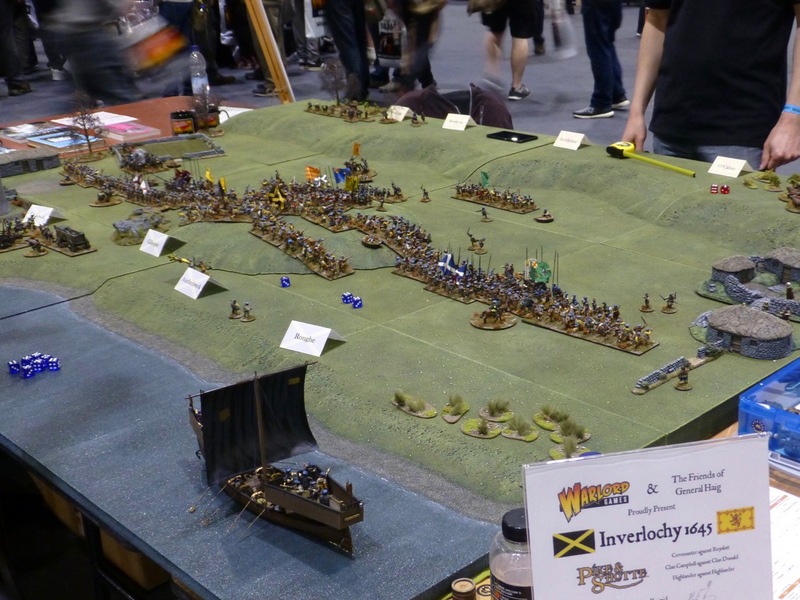 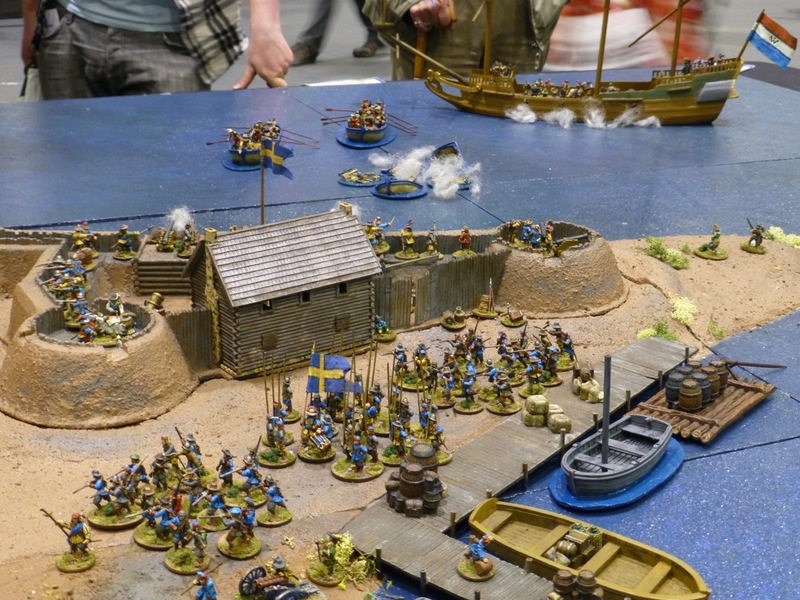 One of the outstanding gaming tables at Salute 2018 was built by Bill Gaskin & Friends – another highlight following 2016’s Battle of Wilhelmstadt. 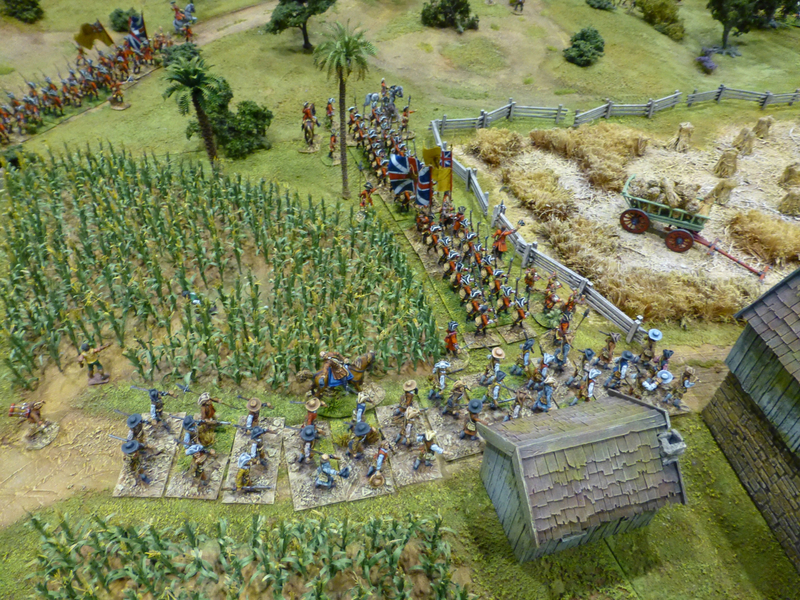 ‘Raid at Gaskin’s Plantation’ was set in 1761 and portrayed a fictional Spanish incursion into Florida. 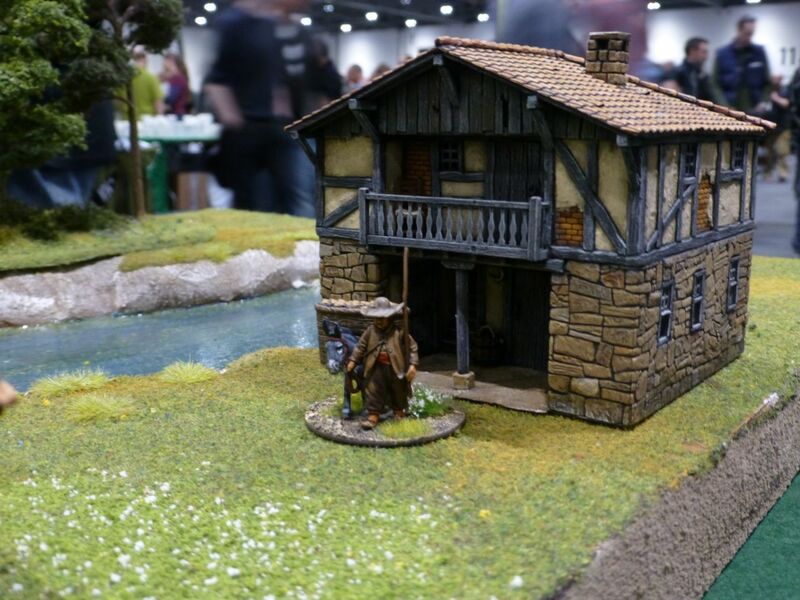 Some more atmospheric close up shots (no pun intended) by undeadhighelf. 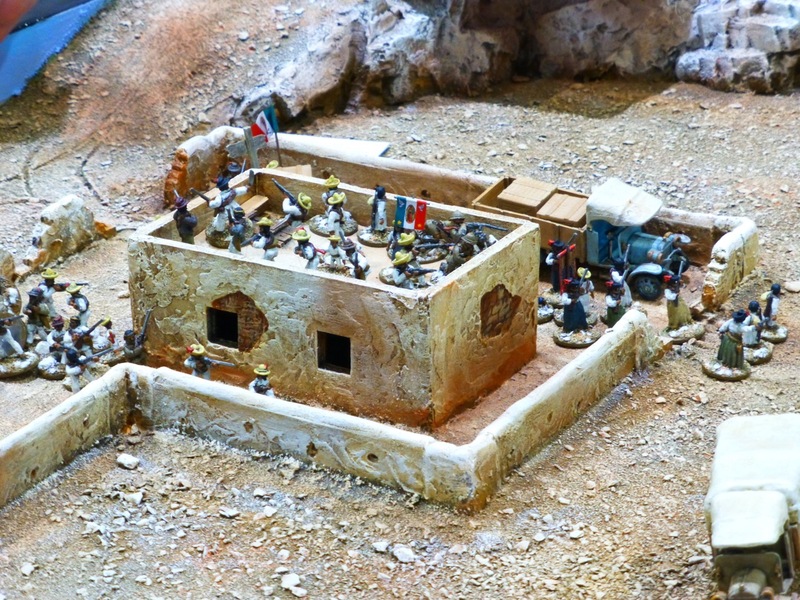 The League of Gentlemen Anti-Alchemists sent Garibaldi’s Redshirts to rescue a beautifully constructed convent in the year 1860. 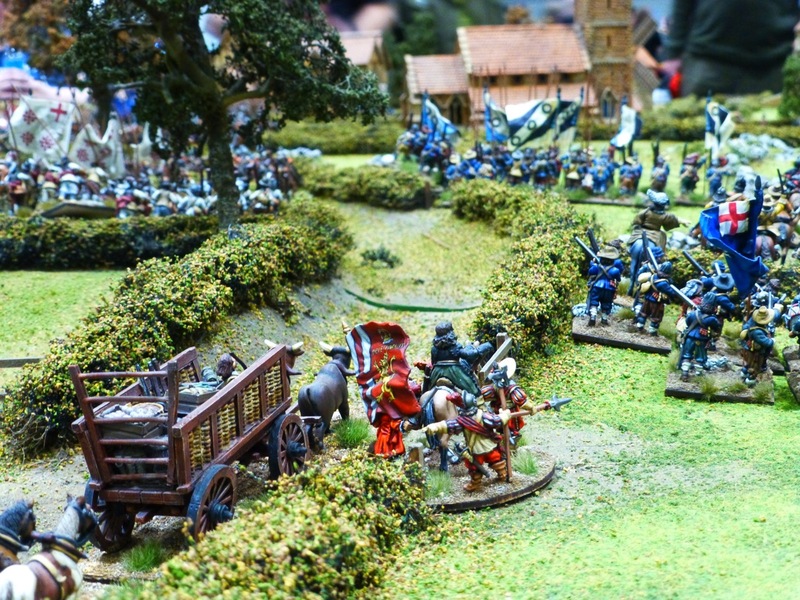 Dalauppror presented the Battle of Stäket, which took place on 13th August 1719 during the Great Northern War and pitched Russians versus Swedes. 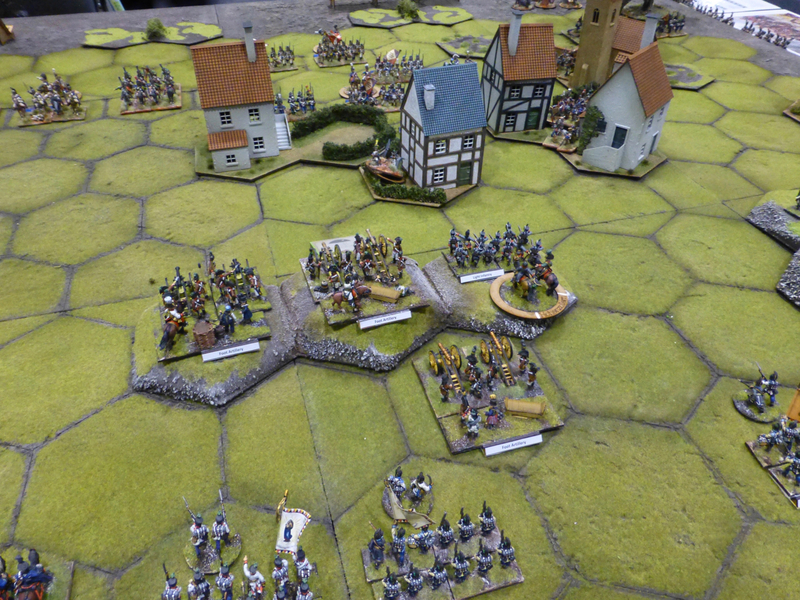 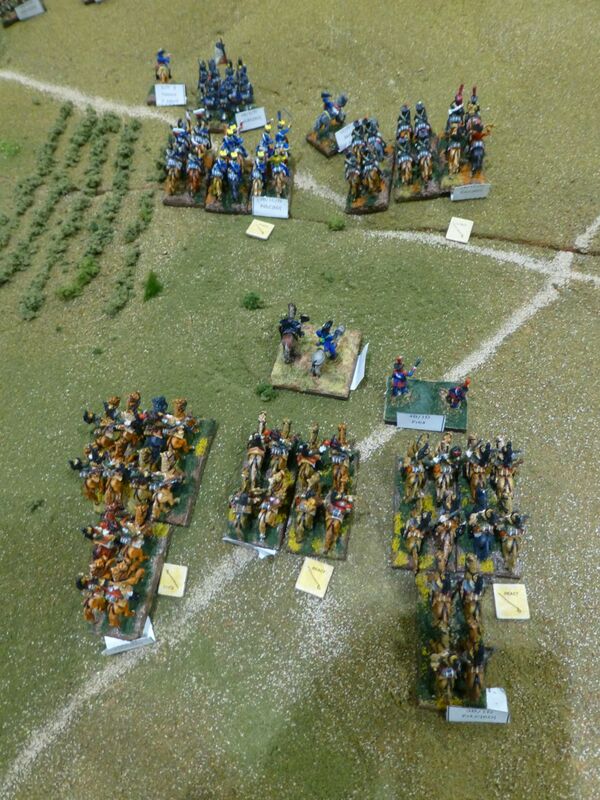 The scenario was played out using The Pikeman’s Lament set of rules. 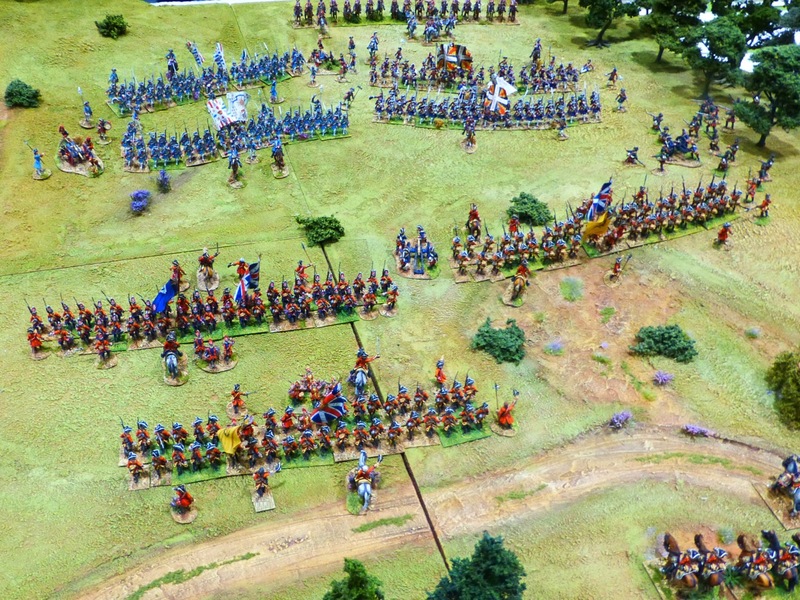 The hypothetical ‘Battle of Freeman’s Farm’ during the American War of Independence in 1777 was staged by the Essex Warriors. 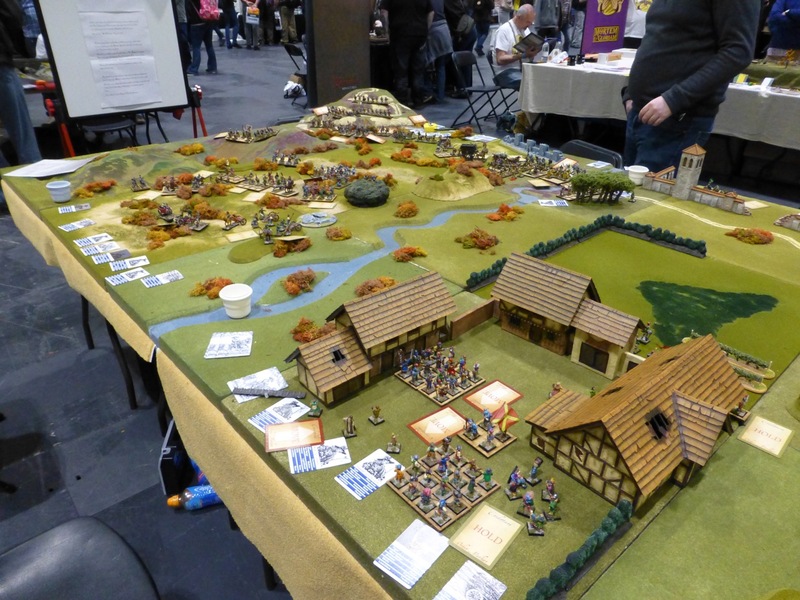 Further games within the wider era ranged from Napoleonic to British colonials in India. 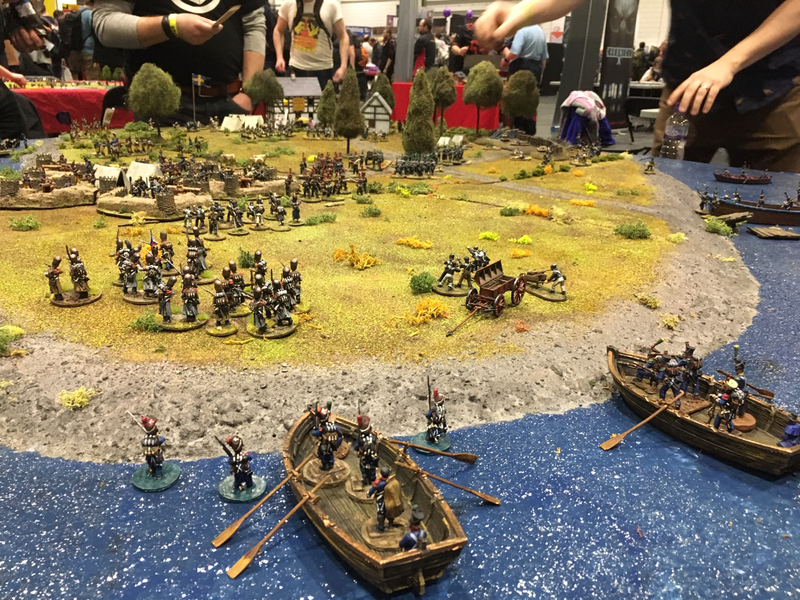 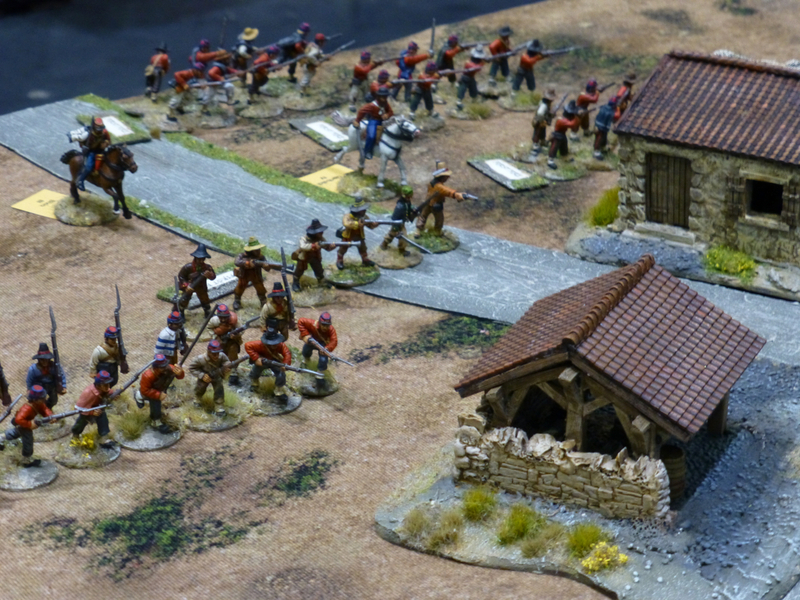 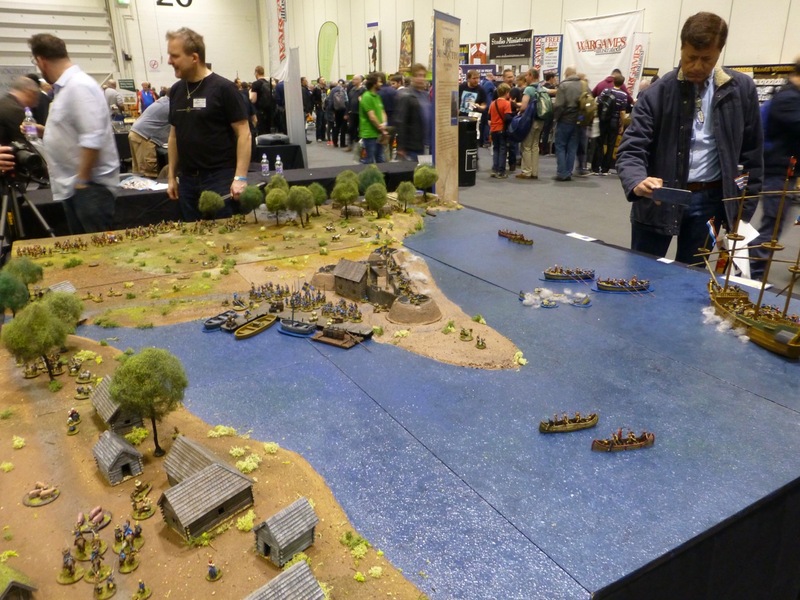 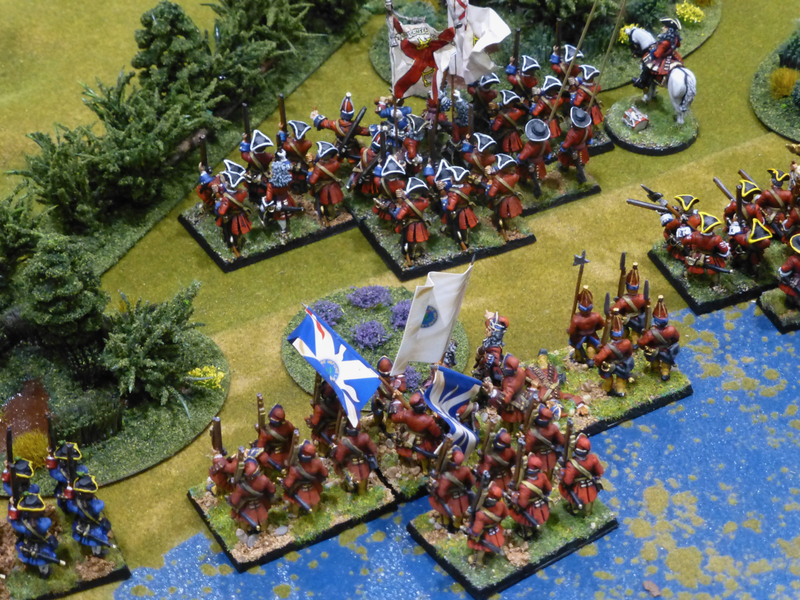 Best of Show at Salute 2015 deservedly went to Ron Ringrose and the Essex Gamsters for “Fort George”, based on a Bernard Cornwell novel set during the American War of Independence. 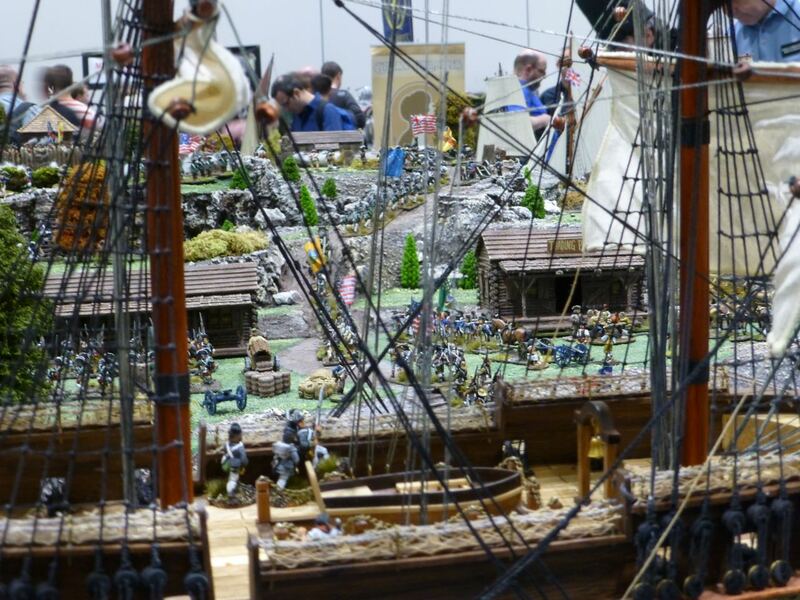 The custom built terrain including ships and the level of detail in all the miniatures made this the stand out spectacle of the show. 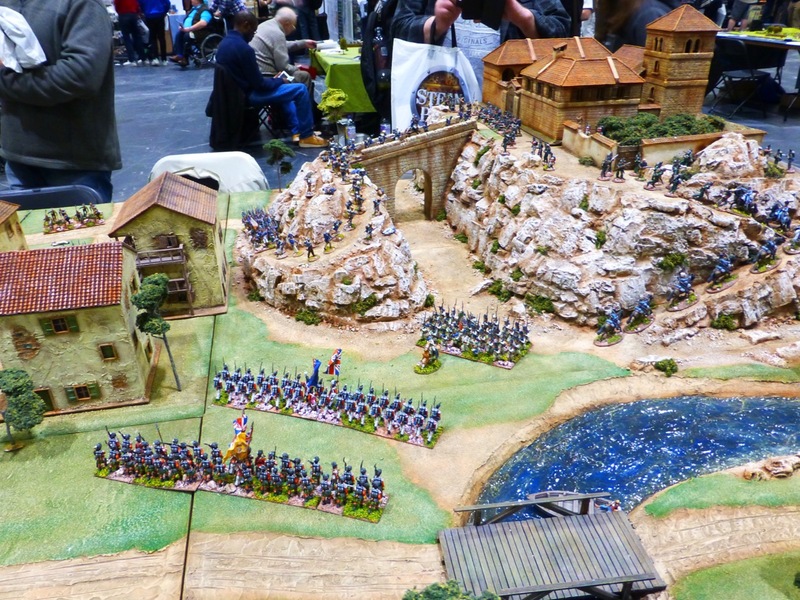 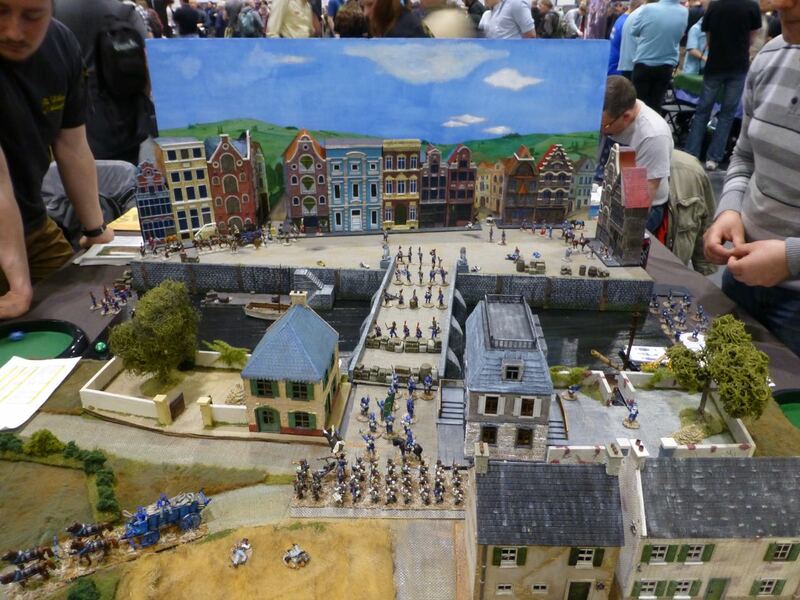 Tin Soldiers of Antwerp brought another lovingly created table this year depicting the Napoleonic “Battle of Charleroi”. 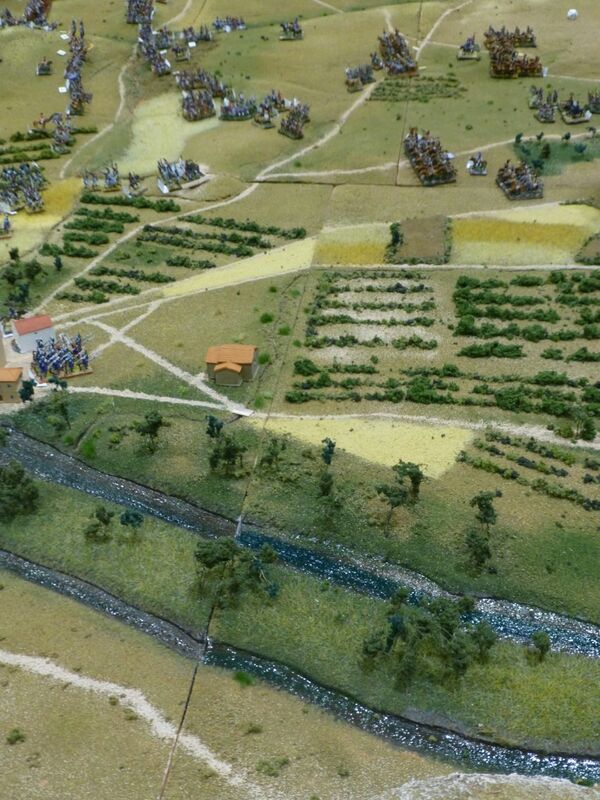 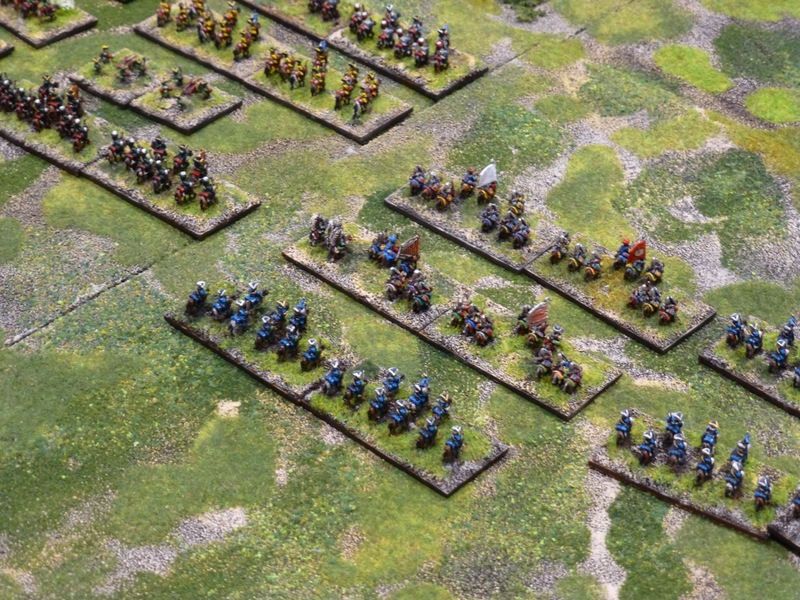 Blockbuster Wargames staged “The Battle of Lützen” in 1632 along a massive frontline. 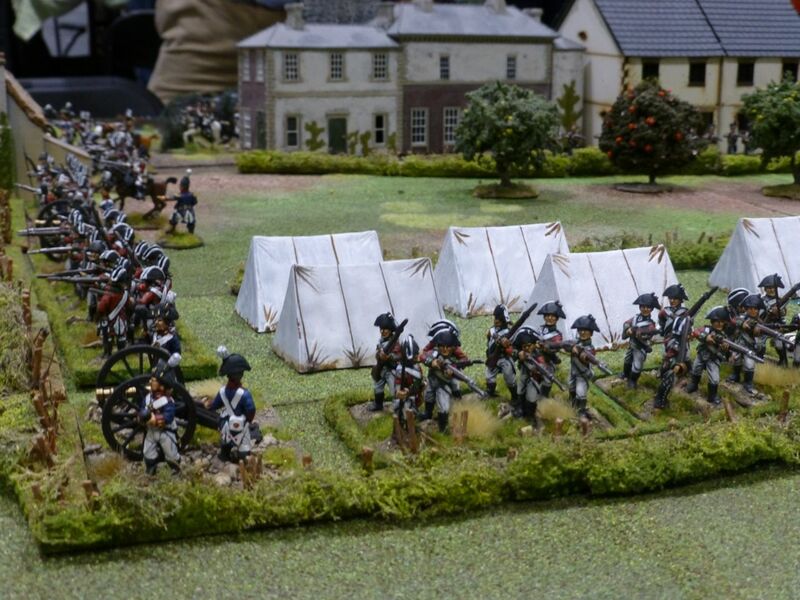 “Napoleon: The Last Gamble” was presented by Loughton Strike Force using the General de Brigade set of rules. 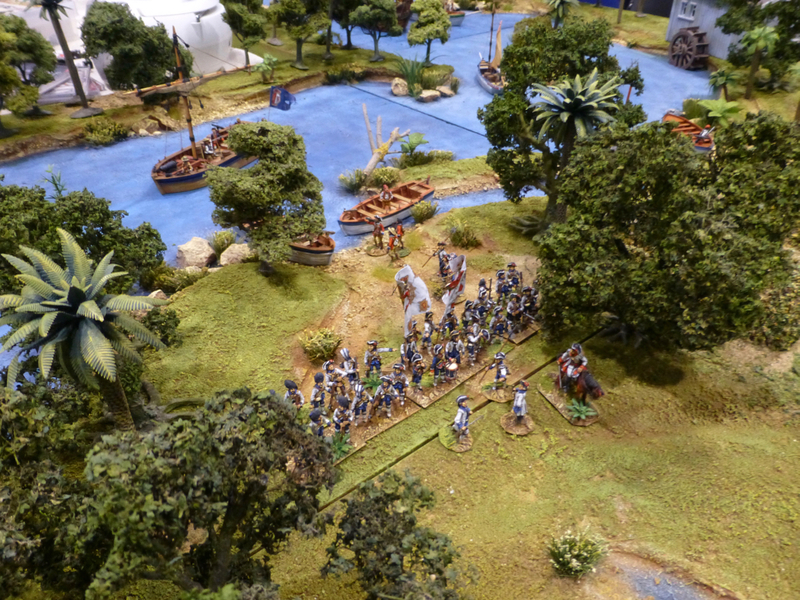 “Lake of Death – The Battle of Aruara” during the South American Wars of Independence was created by the South London Warlords. 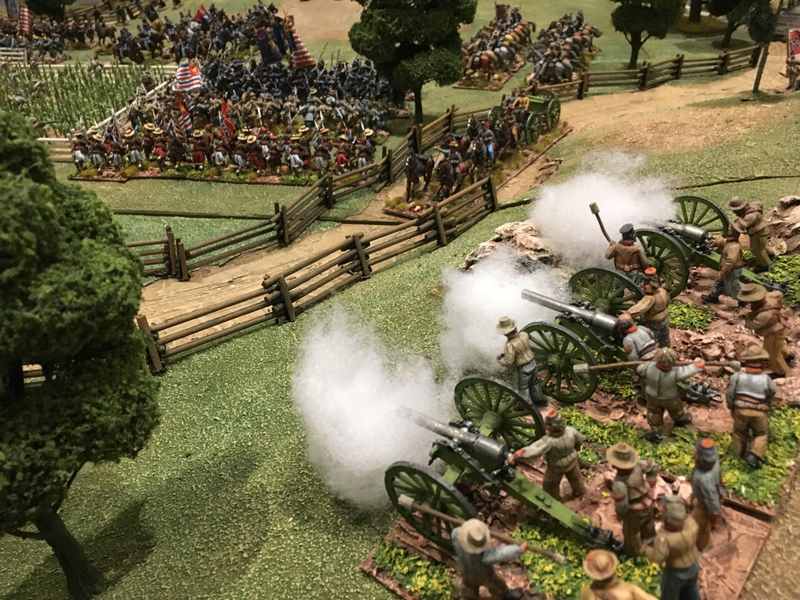 Black Powder rules were in play for “The Battle of Guilford Courthouse” during the American War of Independence by Newark Irregulars. 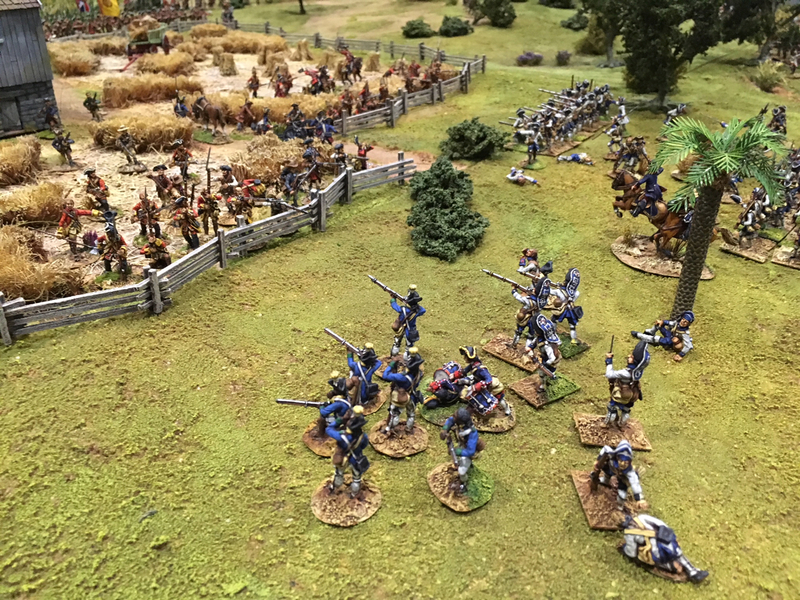 Battle displays from the 18th and 19th centuries always make for a visual spectacle with plenty of colourful uniforms, banners, cannon and cavalry. 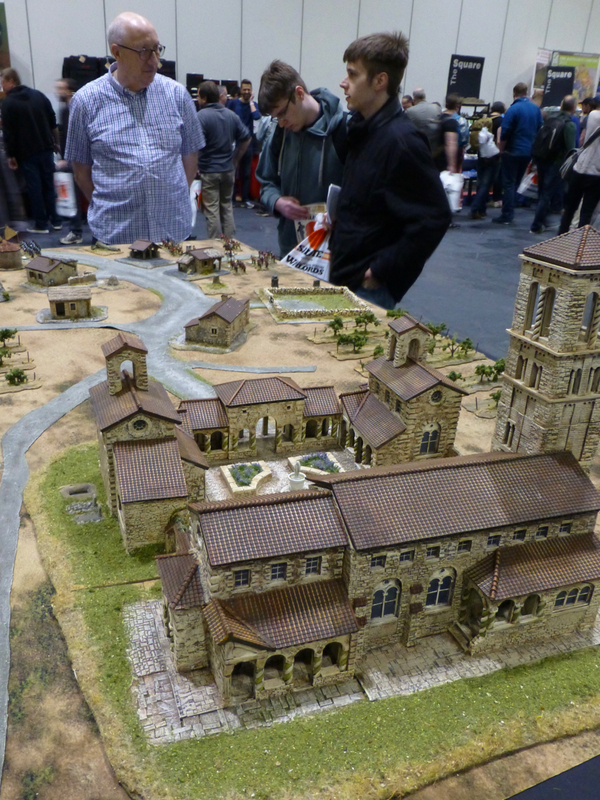 Salute 2014 had its fair share of these as would be expected. 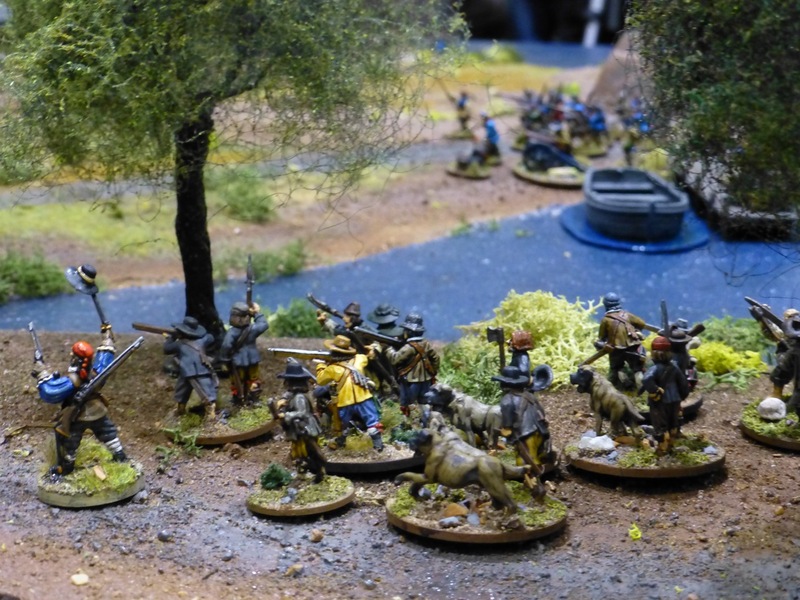 The South London Warlords’ own Battle of Barbastro during the 1st Carlist War was arguably the most imposing and also had plenty of nice little touches. 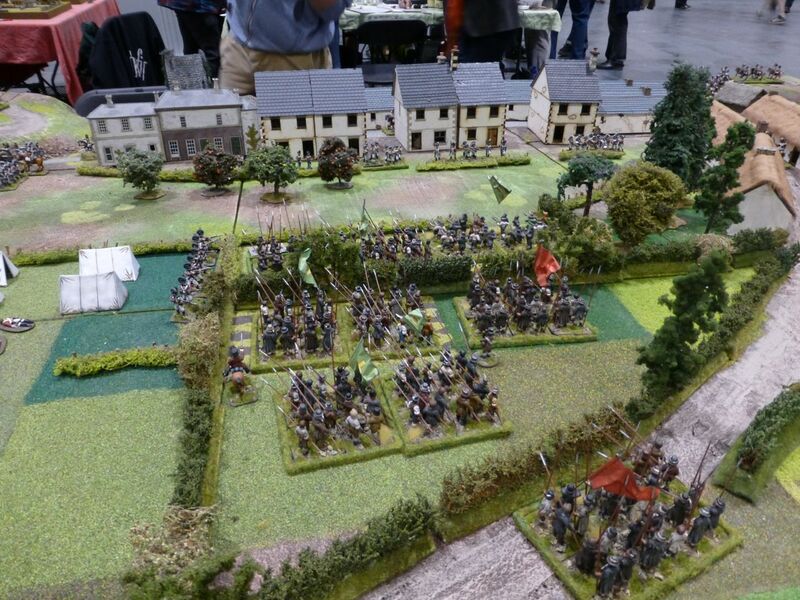 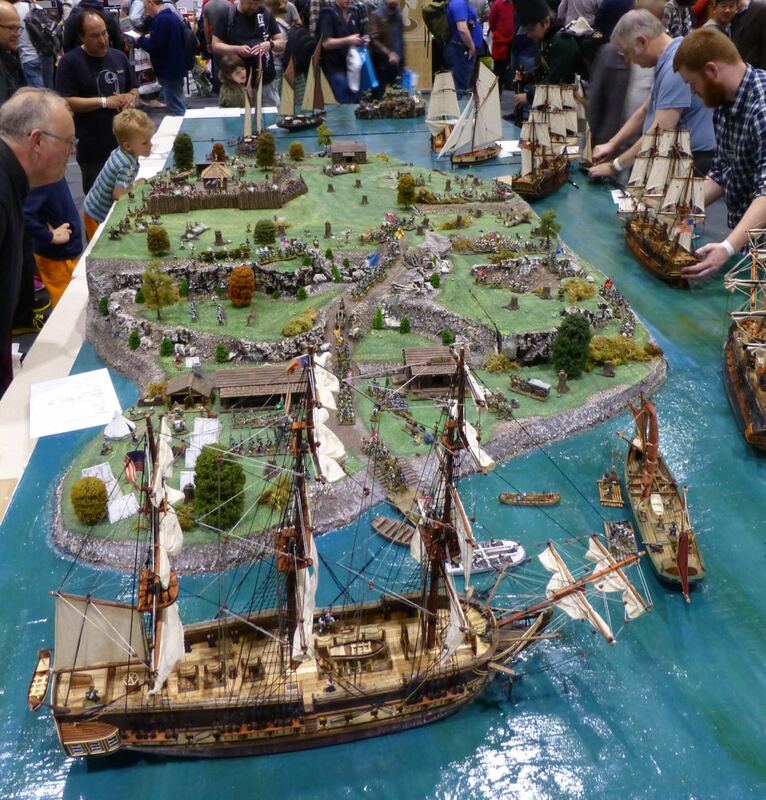 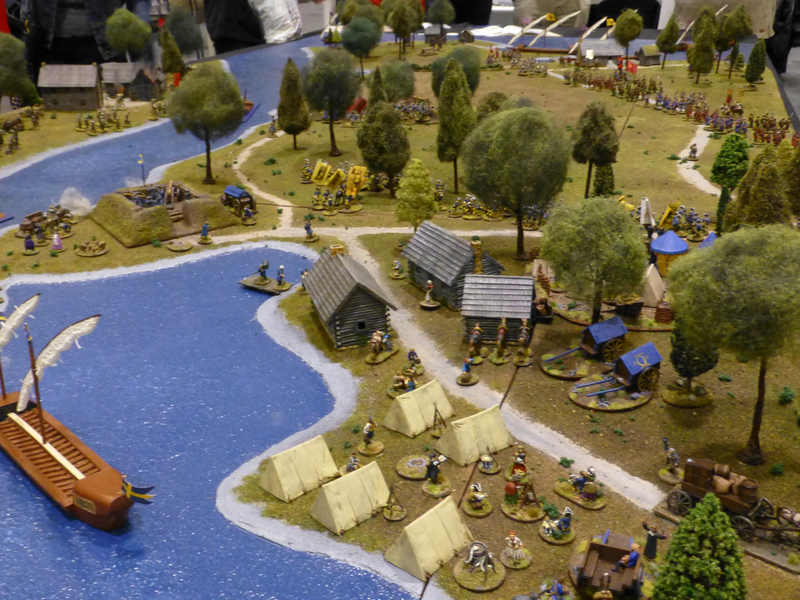 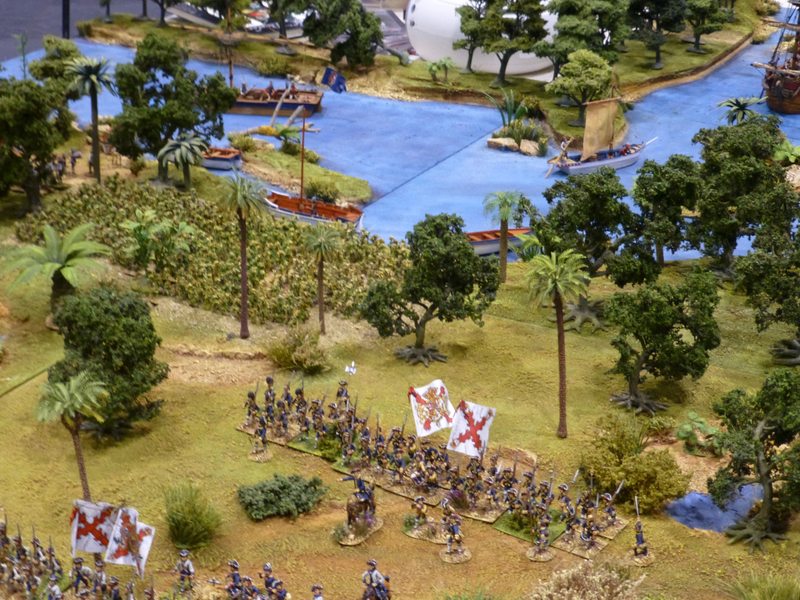 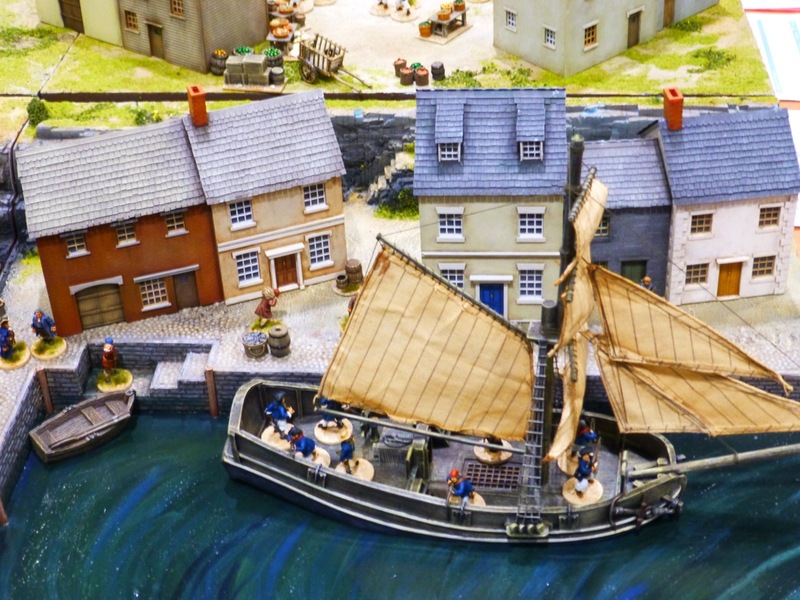 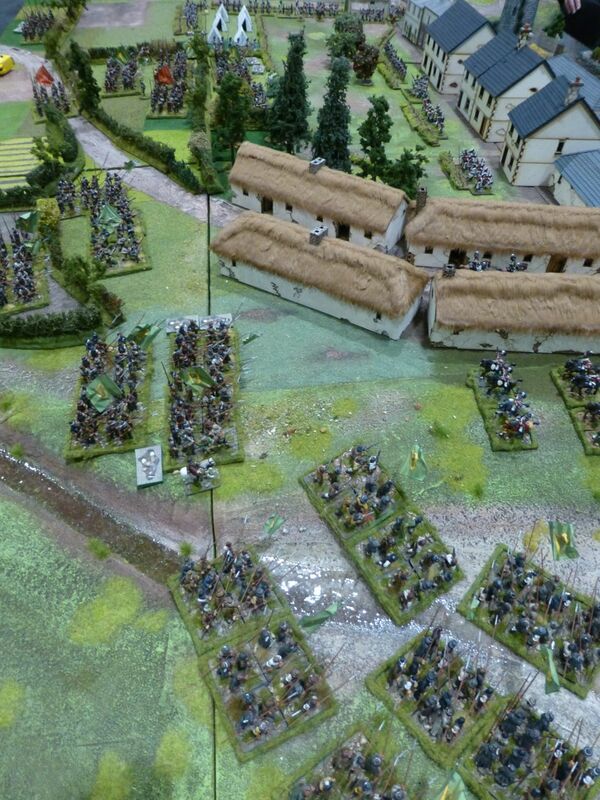 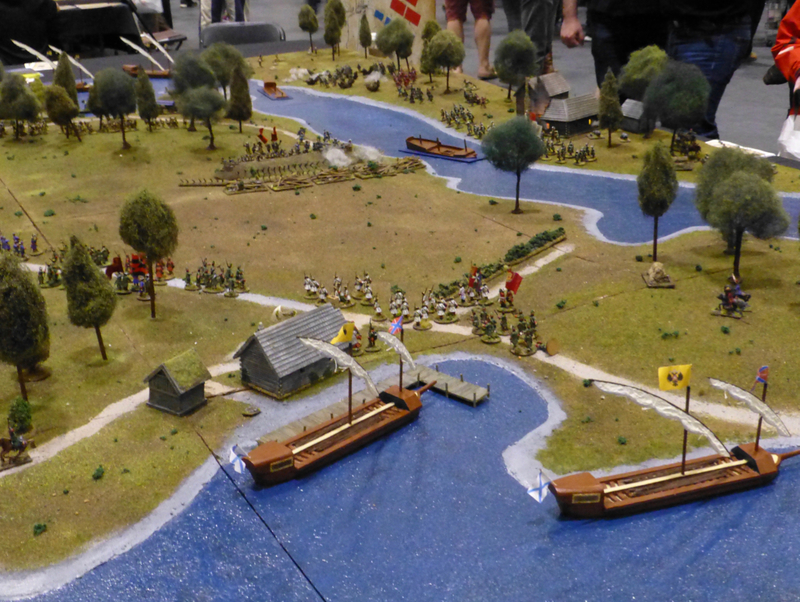 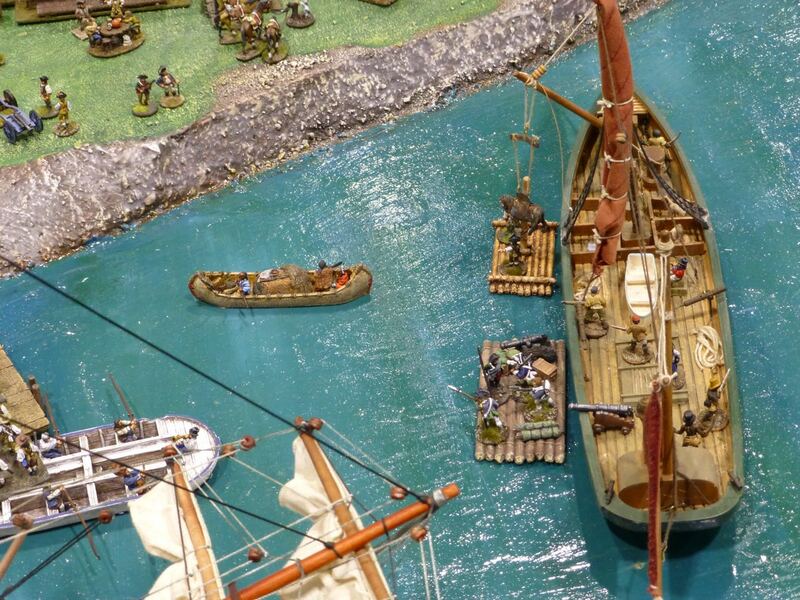 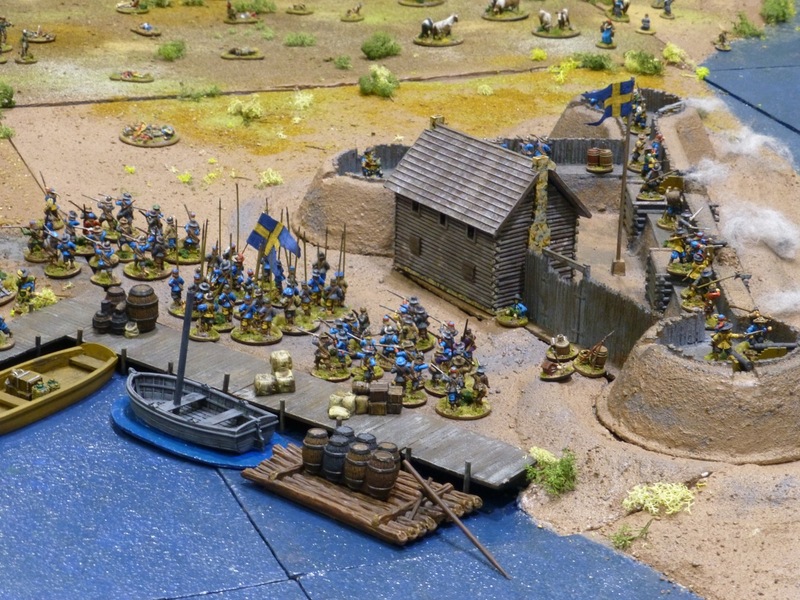 Wargames Illustrated recreated the Battle of Arklow from the Irish Rebellion with an imposing array of forces and scenery to match. 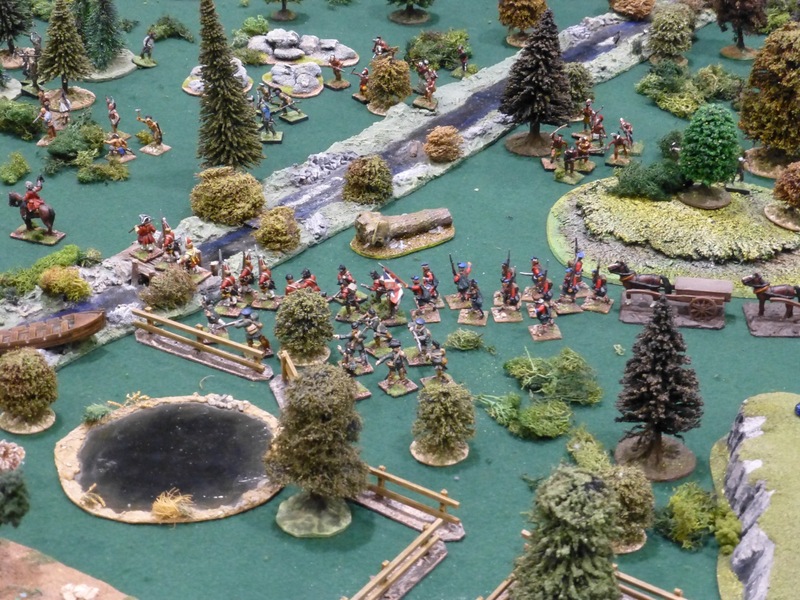 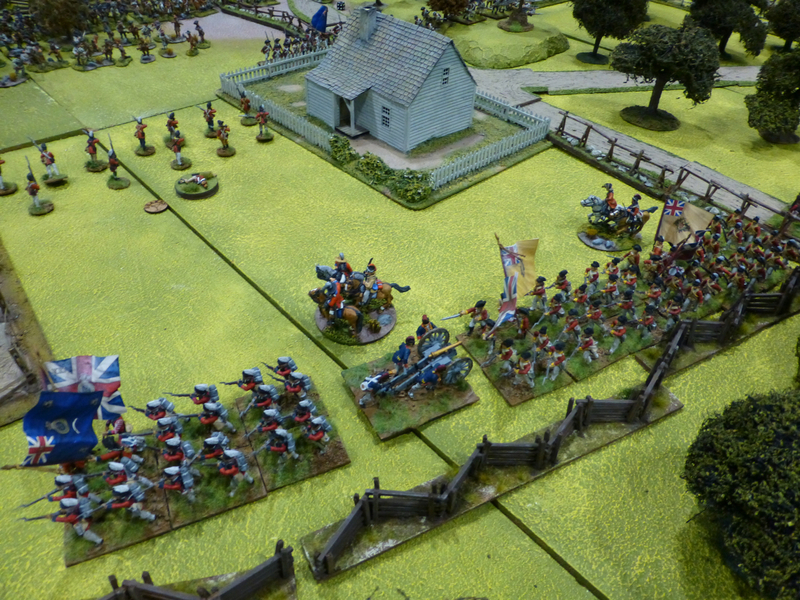 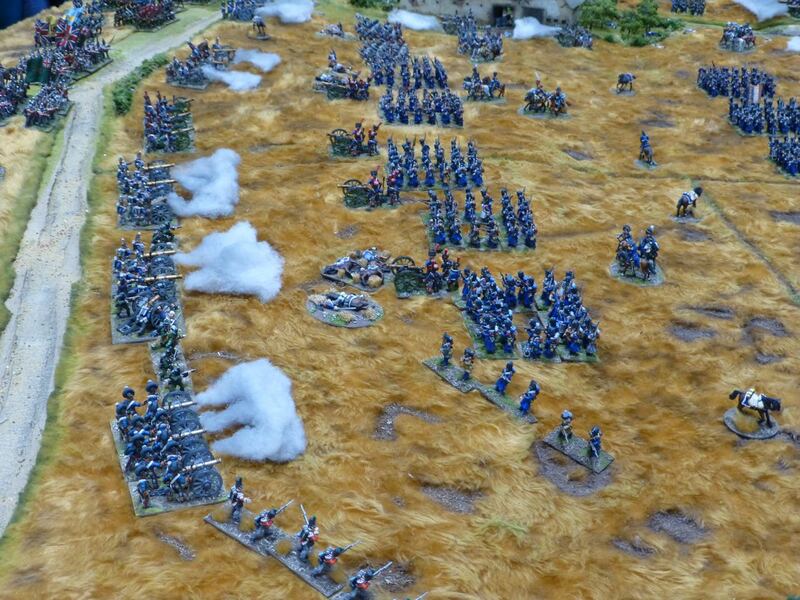 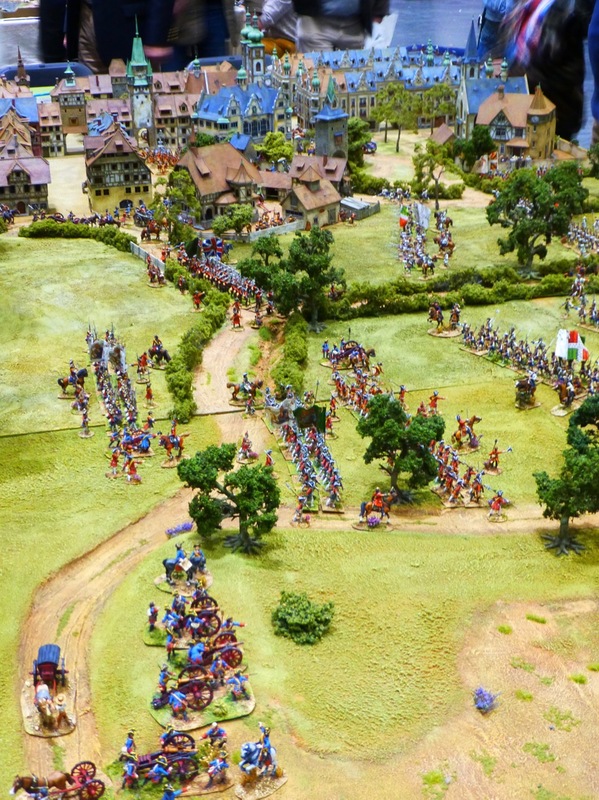 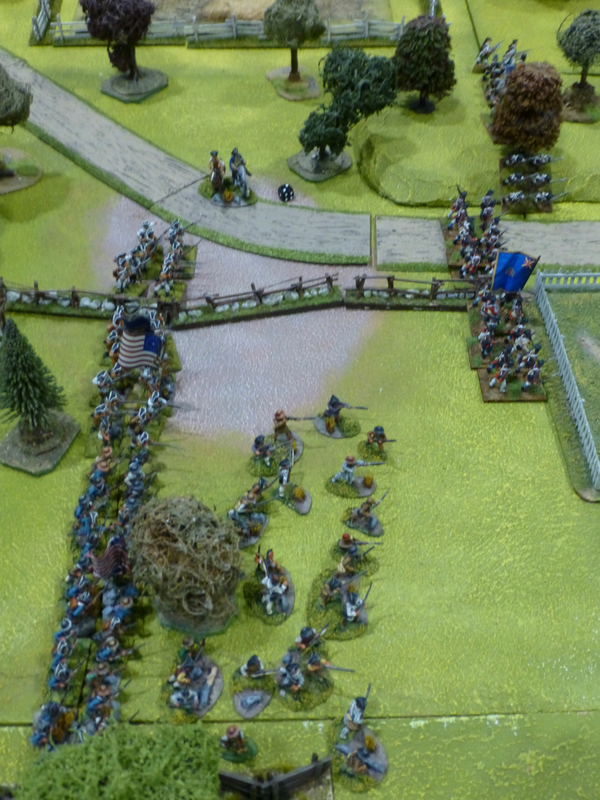 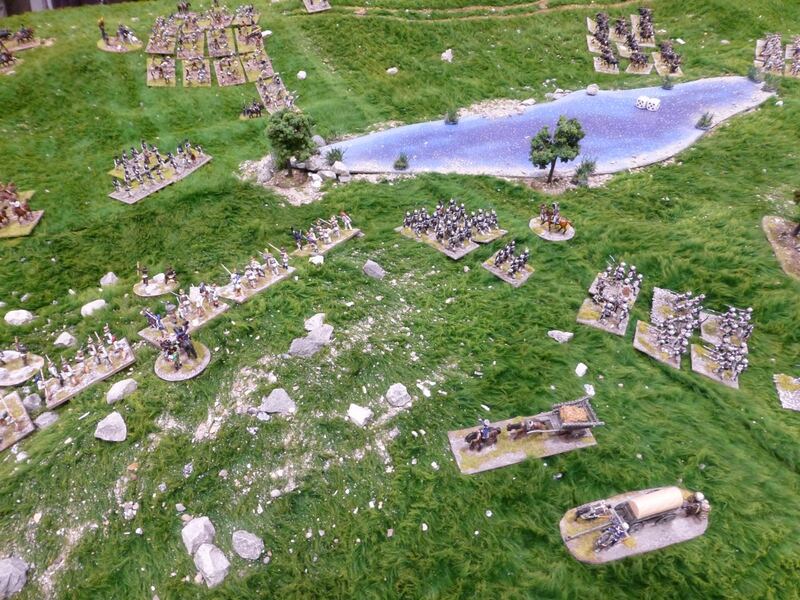 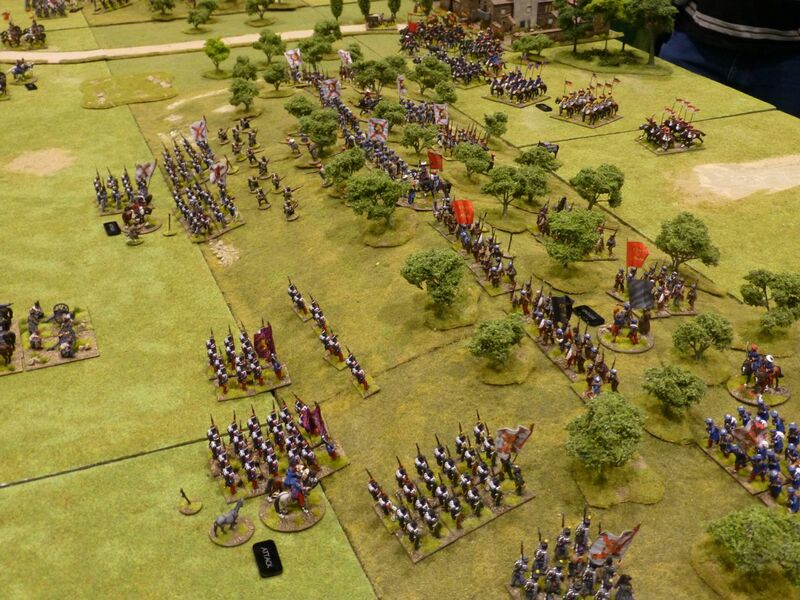 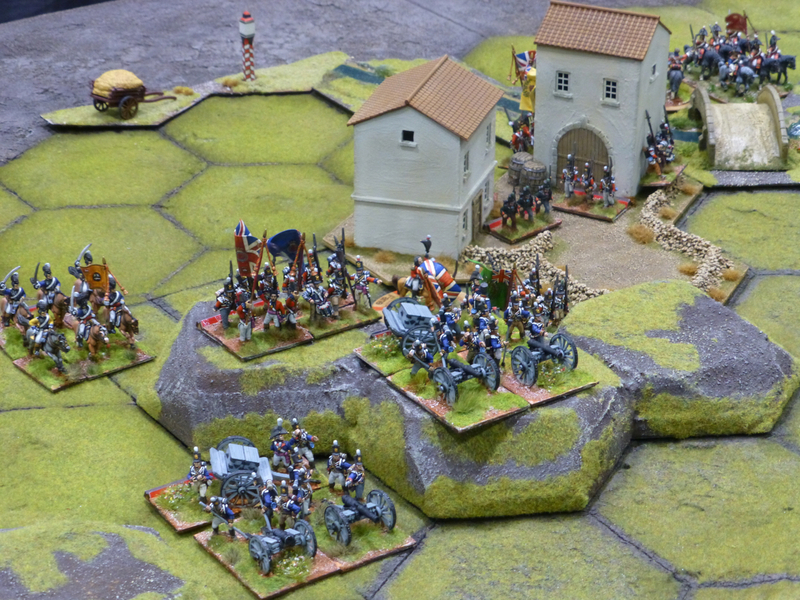 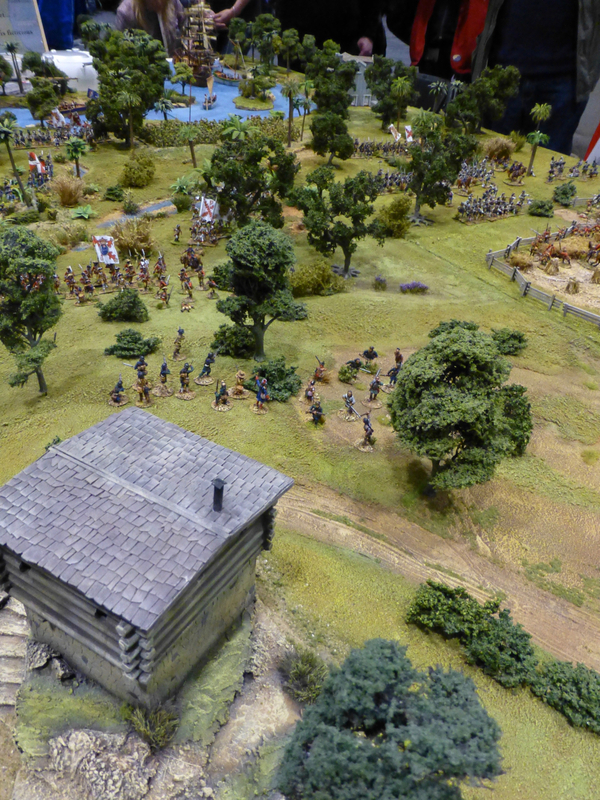 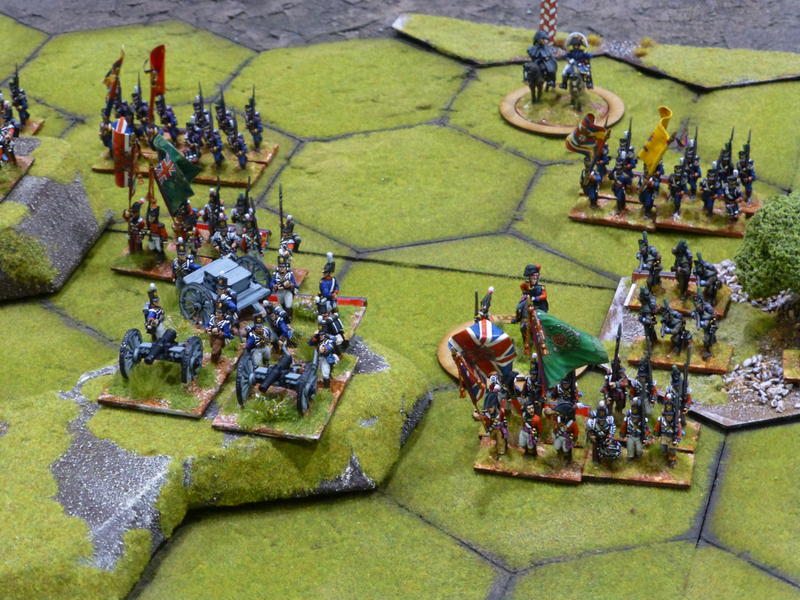 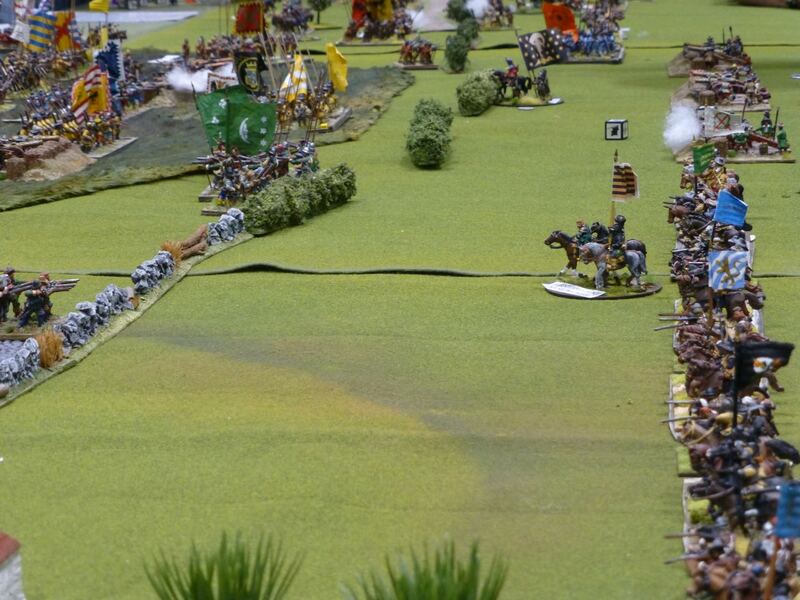 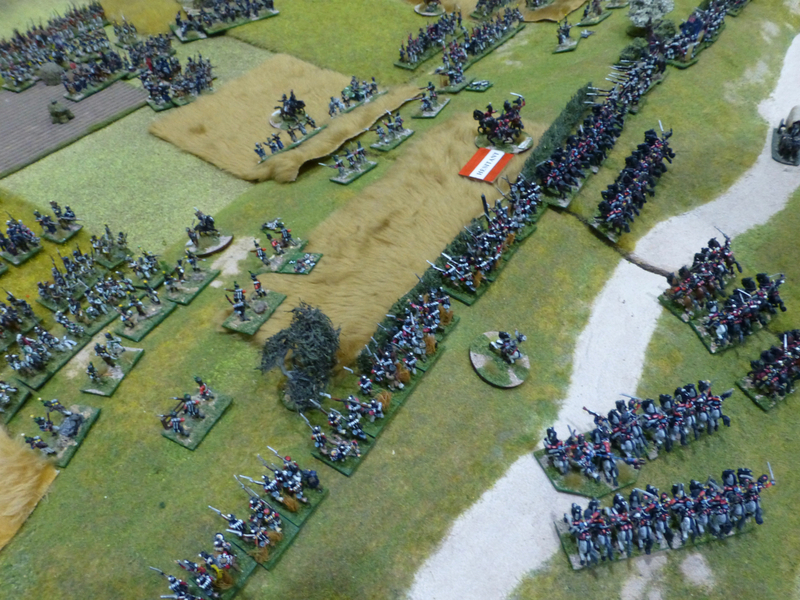 Napoleon’s Battles were the background for a sweeping battlefield in 18mm scale by Capitan Games. 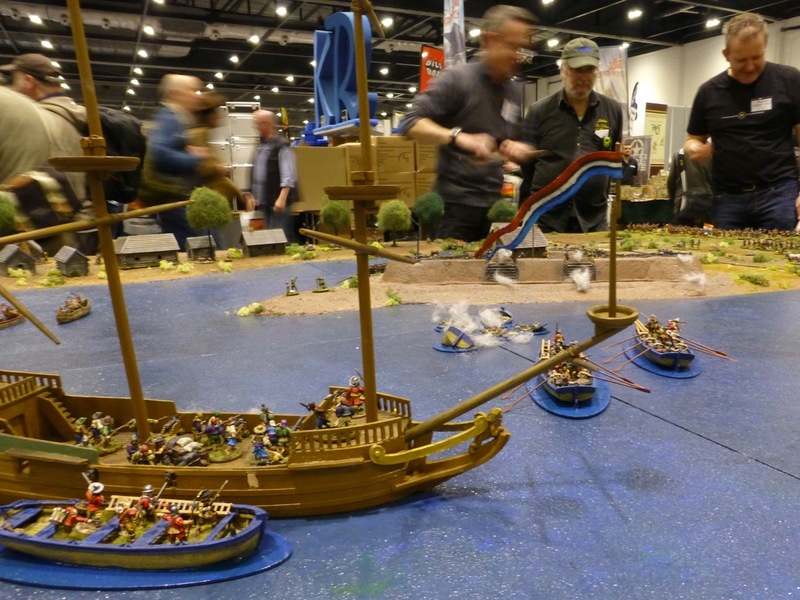 The Golden Age of Piracy provided the setting for skirmishes by Spirit of the Game using their own set of rules and pitching redcoats against bands of pirates in a Caribbean port in 40mm scale.